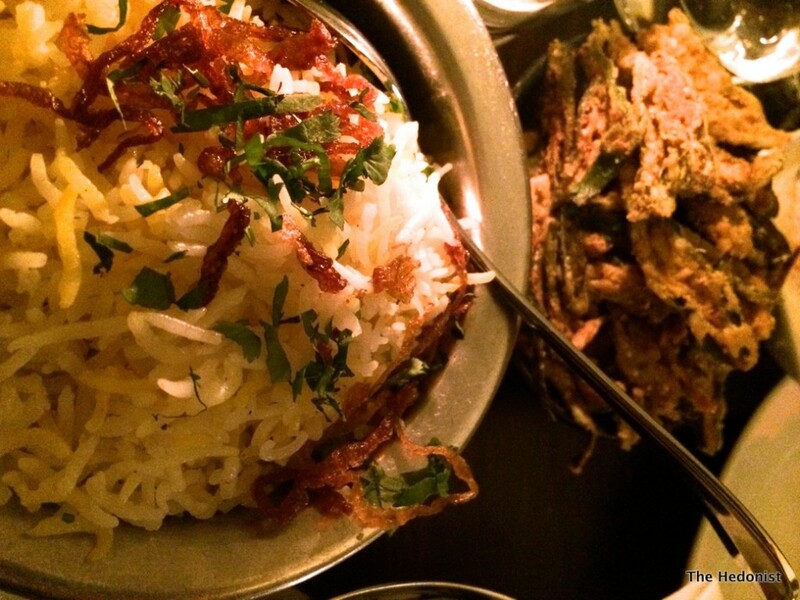 Indian street food is definitely having a moment. 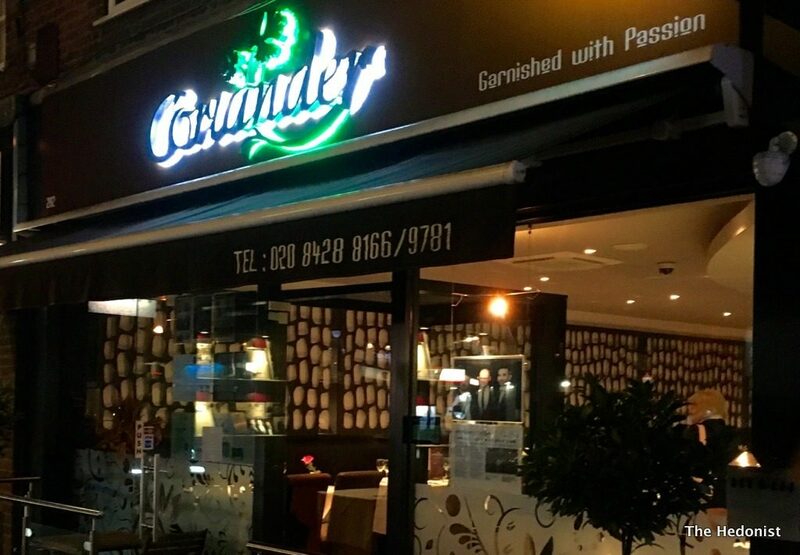 I loved Chef Vivek Singh’s Cinnamon Bazaar in Covent Garden where the chaats zing with flavour (see my review) and just when you thought things couldn’t get any more exciting along comes the recently opened Chai Thali in Camden. 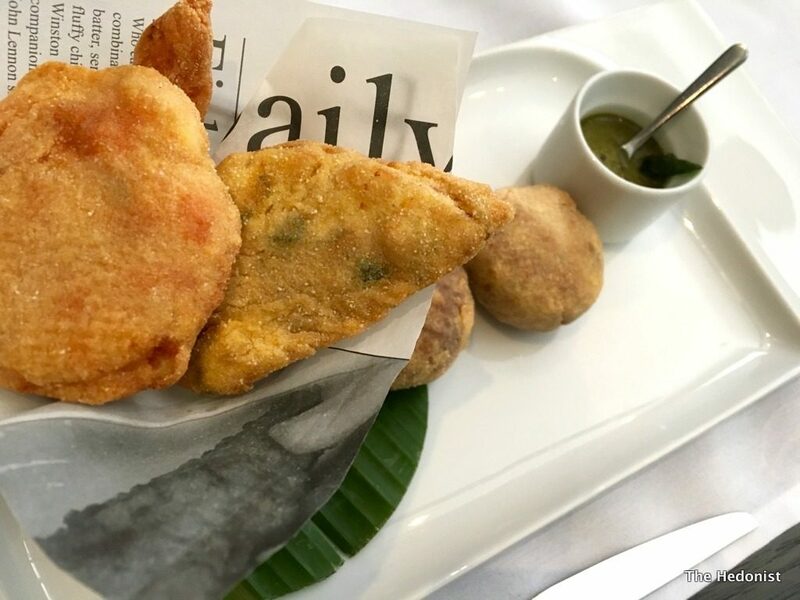 Owners Raj, AJ and Neil have scoured the subcontinent to create a menu that brings together kerb-side snacks sourced from the Punjab to Kerala. 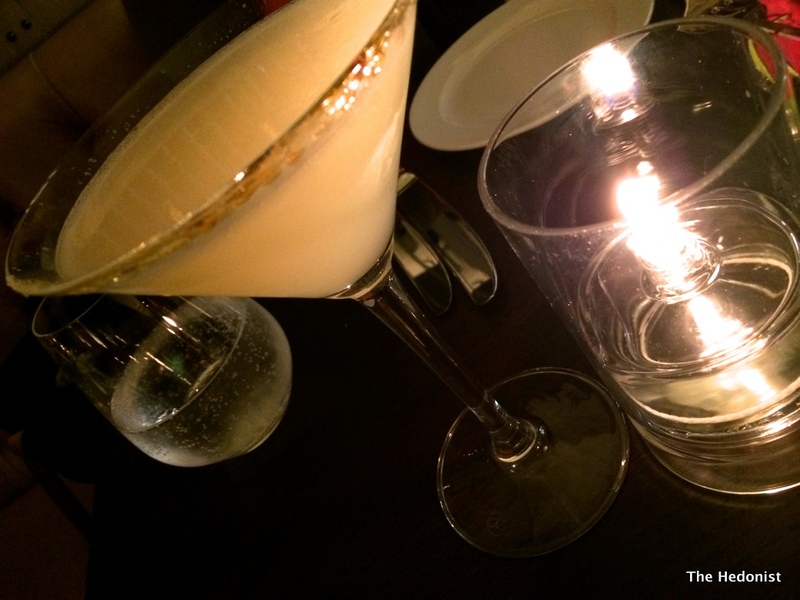 And with a drinks menu that includes cocktails, lassis, turmeric lattes, kadak chais, Indian beers there is lots to investigate; so I was really pleased to be invited to sample some of the highlights from the menu. 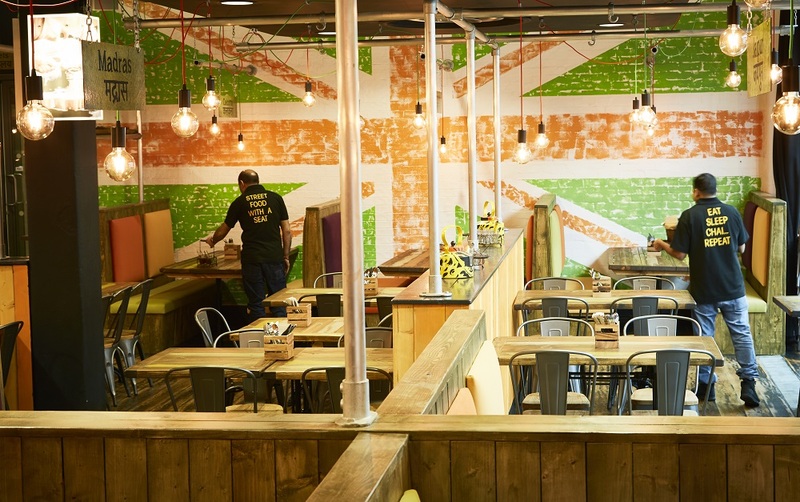 The interior crosses over the street food ‘shack aesthetic’ with a contemporary London twist to create a vibrant interior that is a great showcase for the food. 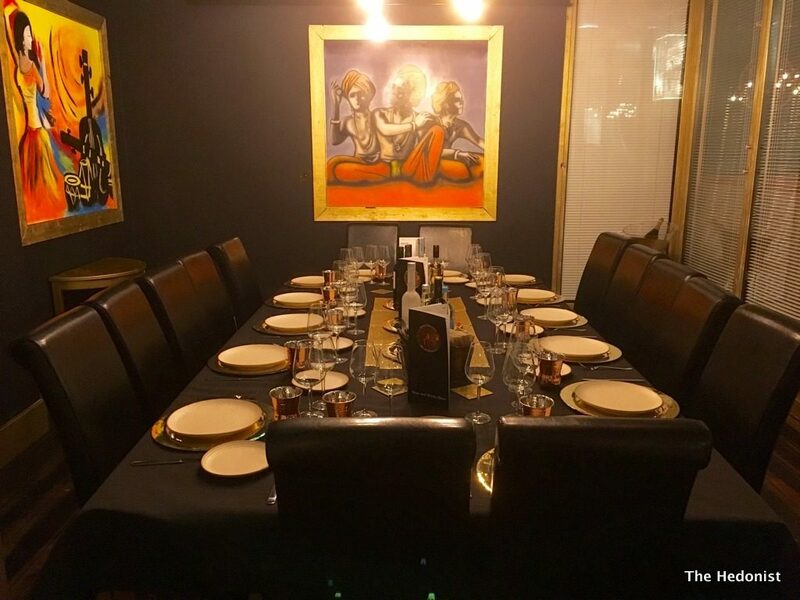 And there’s even a private dining room for business or private parties. 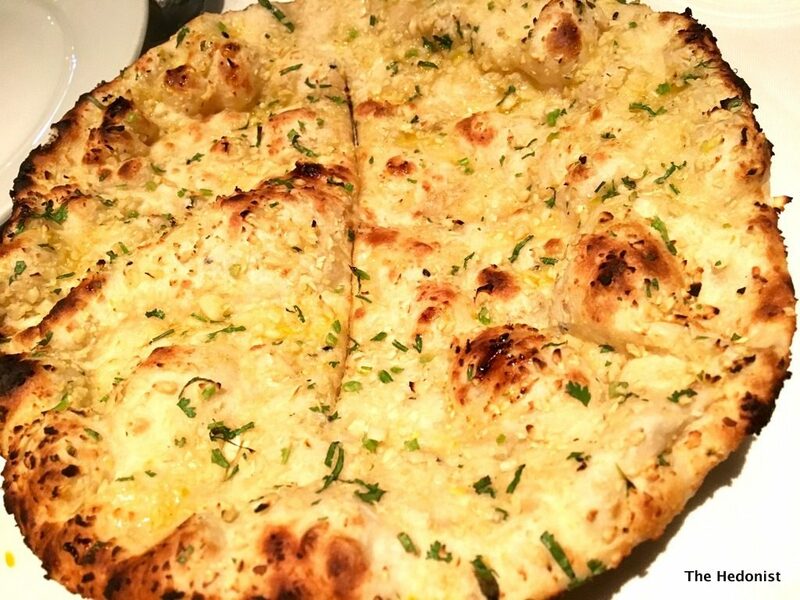 The restaurant boasts a team of Punjabi chefs gleaned from from the kitchens of the Taj and Ambassador hotel groups and has a dedicated Tandoor Chef with all the meat being strictly Halal. But before we got down to the food it was time for cocktails (£8.50). The Chai spiced Mojito was a sweet dark mojito made with Captain Morgan spiced rum, mint leaves, lime chunks, Chai tea bags and syrup with soda. 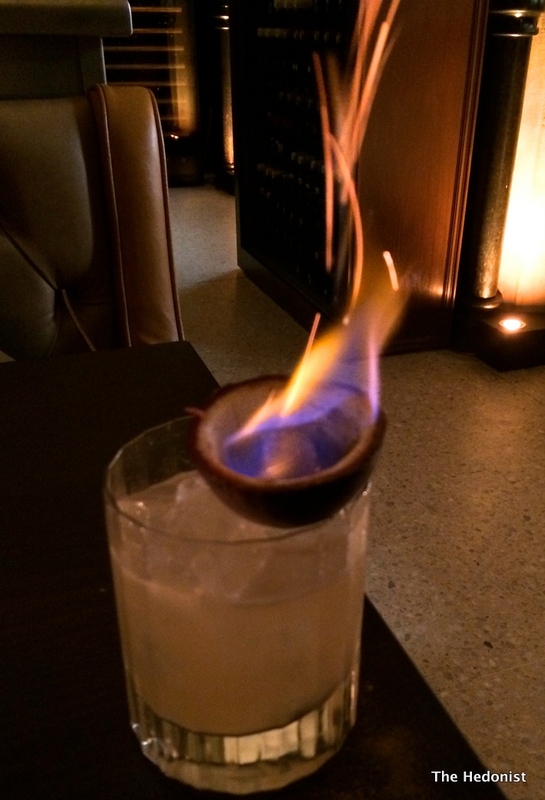 It was great to try the mint and lime with dark rum. 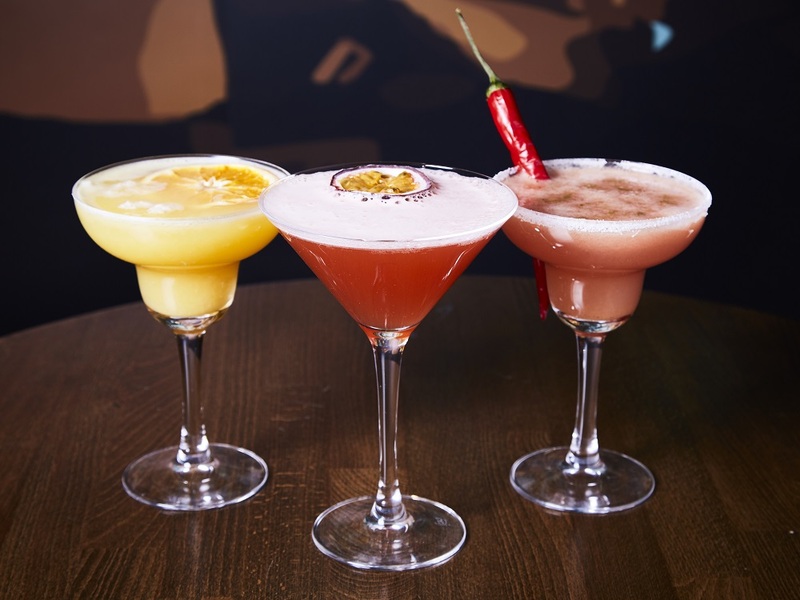 The Goan Bay is a cool fruity blend of vodka, passion liqueur, watermelon liqueur, passion and cranberry juice. 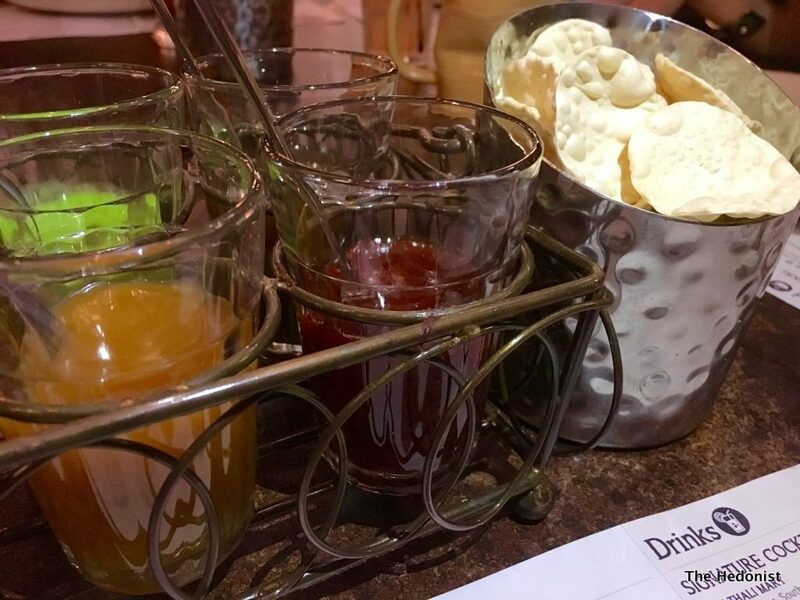 My favourite was the Chai Thali Mary, a grown-up blend of house whisky, Southern Comfort, guava and pineapple juice, tabasco, Angostura bitters and Chat Masala with a salted glass rim. 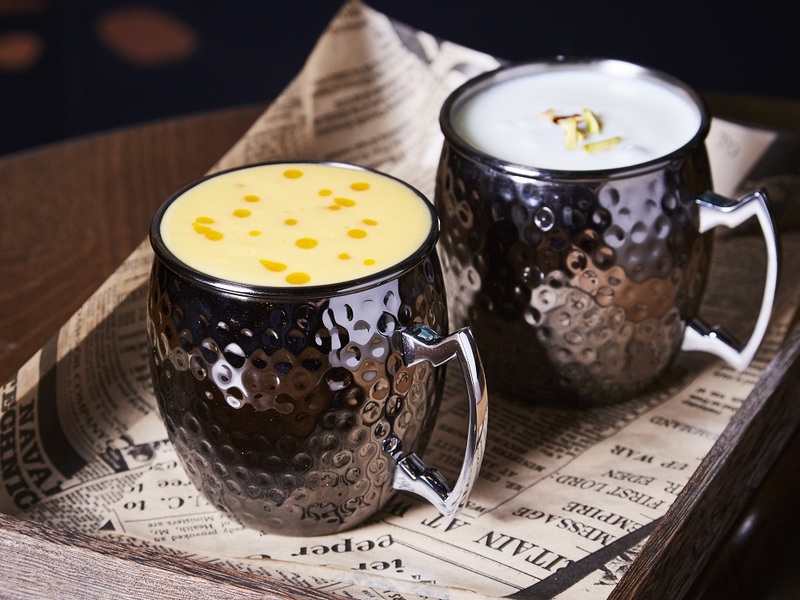 If you’re on the wagon a Mango or Cardomom and Pistachio Lassi (£4.50) gives a rich, creamy base for the upcoming spice. 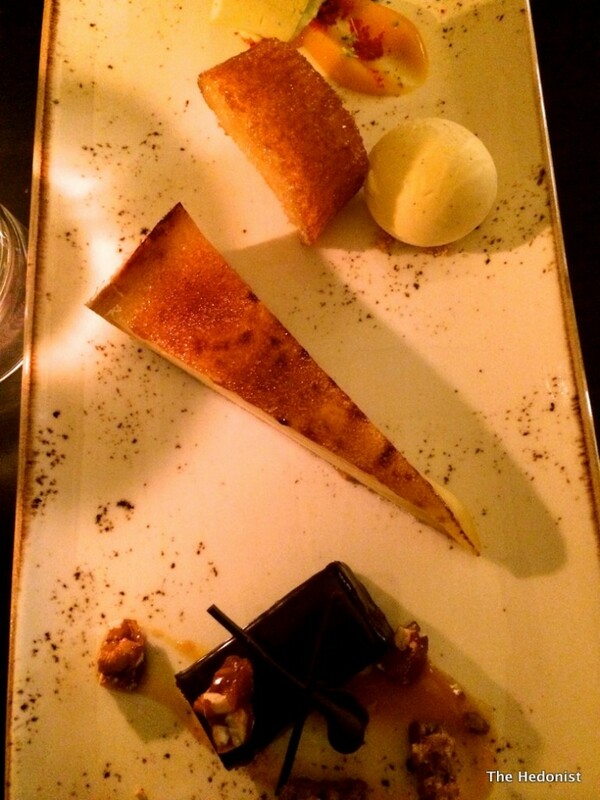 Appetisers started coming thick and fast. 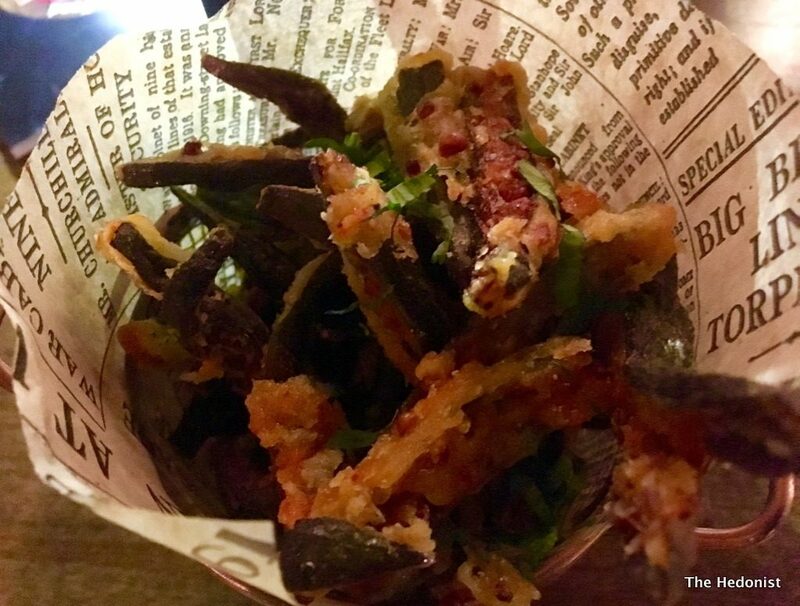 Kurkuri Bhindi were thinly sliced slivers of okra fried in gram flour batter sprinkled with chilli masala. An exercise in crispy salty goodness. 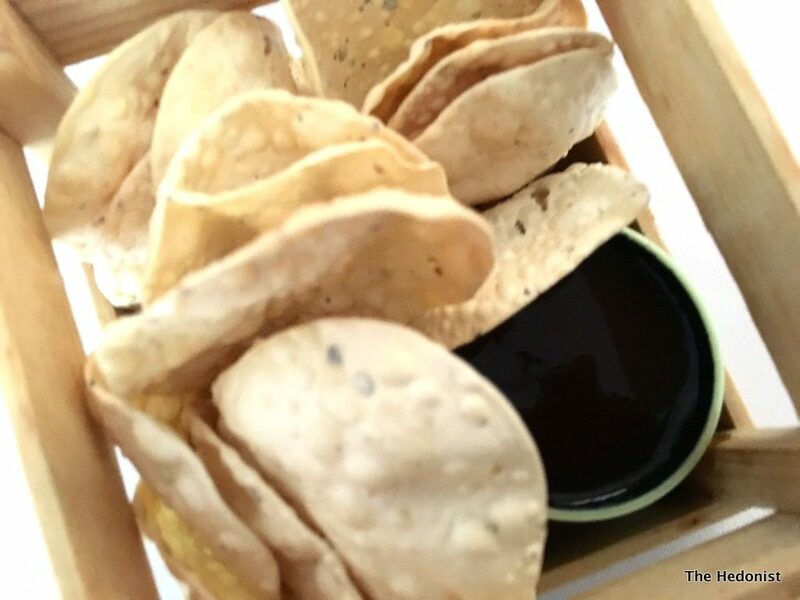 A mini papad basket came with mango, spicy tomato, tamarind and mint and yoghurt chutneys – perfect with the cocktails! 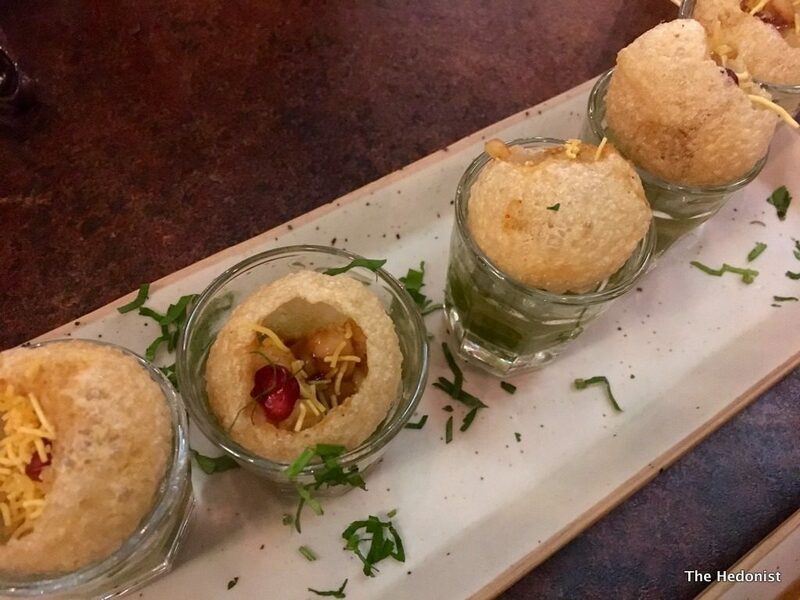 Paani Poori were wheat puff balls filled with masala potatoes which you fill with tamarind water. Down it in one shot for a mouthful of crunchy sweet and sour goodness. 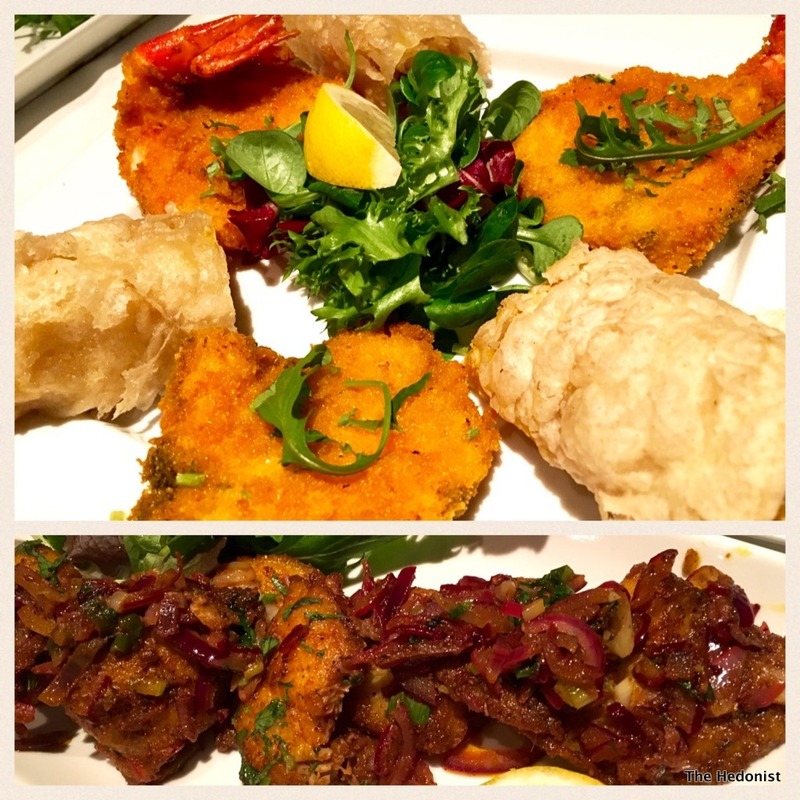 Then it was time for a selection of starters. Punjabi Samosas had a delicious wheat pastry and were filled with peas and potatoes. 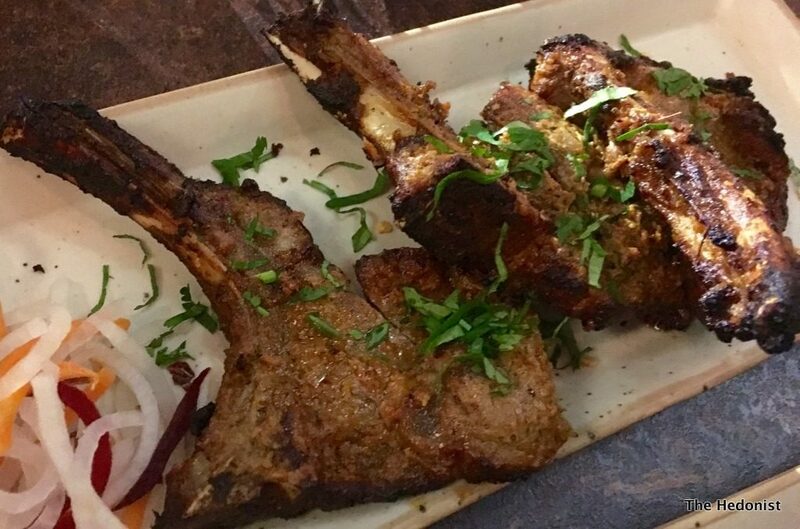 Spicy grilled Lamb Ki Chaampe chops came marinated in spices and were served with kachumber. 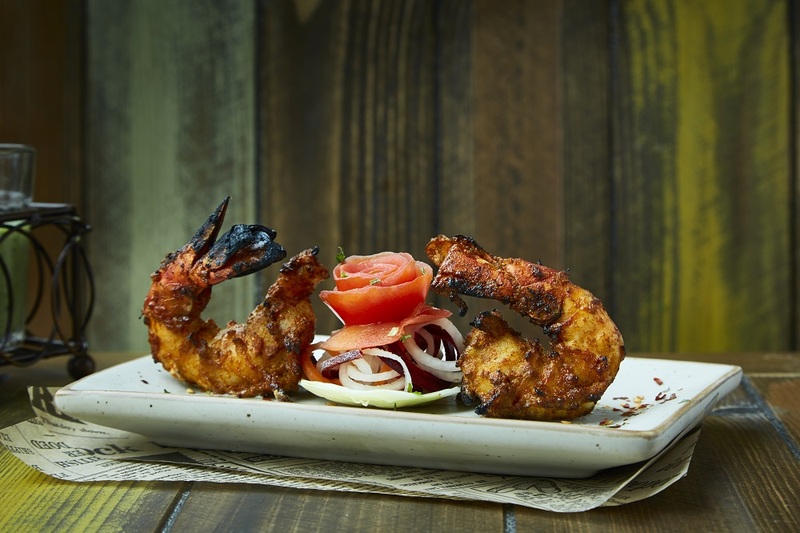 Maharaja Prawns were probably my favourite of the dishes – fat and juicy King prawns marinated in spices and cooked in the clay oven. 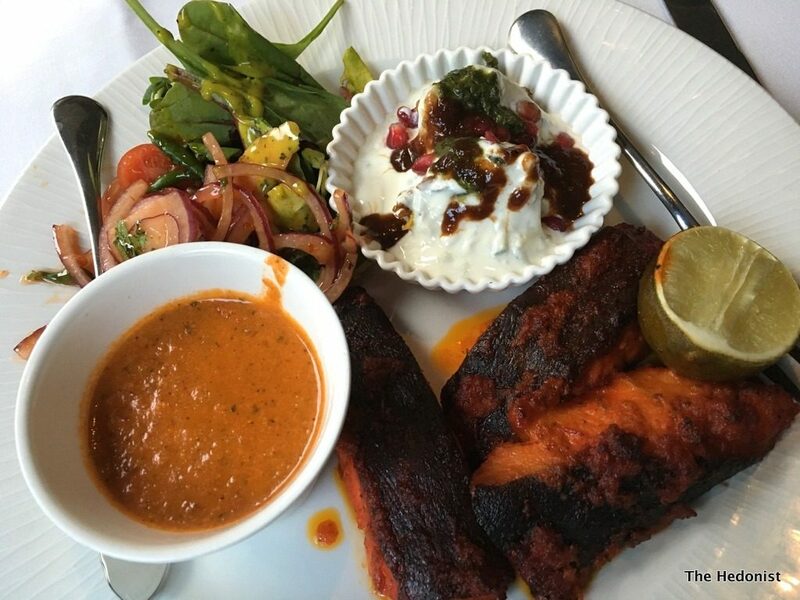 Salmon tandoor was the best tandoor fish I have eaten coming crisp and lightly spiced out of the oven. 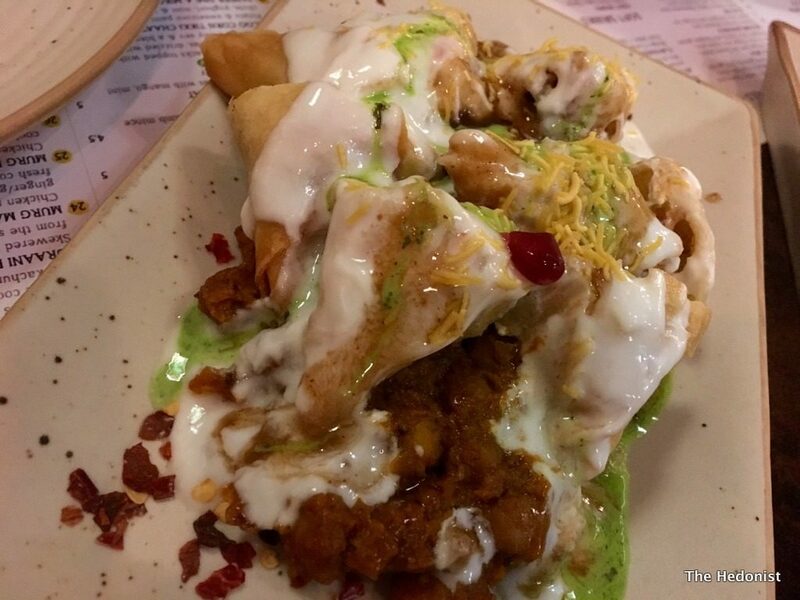 I love chaat and Samosa Chaat, mini samosas laid flat on a bed of of chole, yogurt and chutney was an explosion of textural and flavour pleasure. 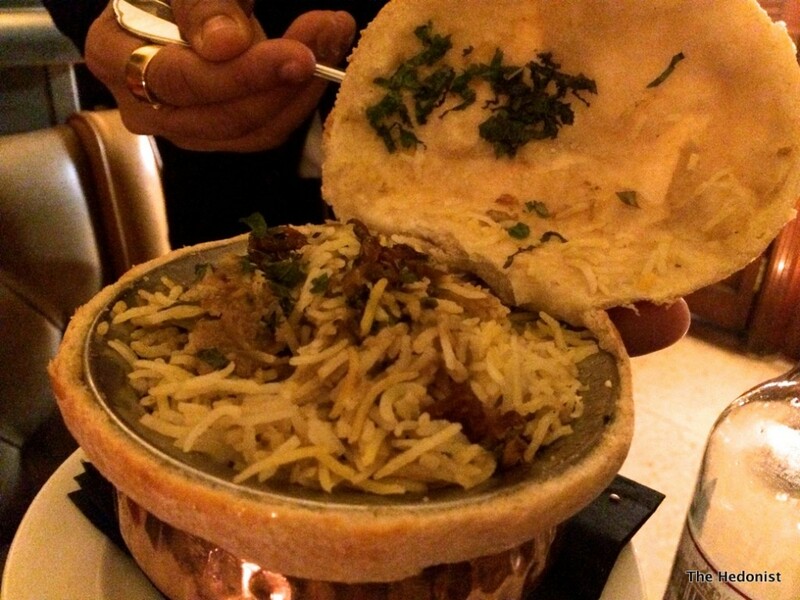 A Fondue of a creamily mild mashed vegetable curry came served with grated cheese and a brioche bun for dipping. 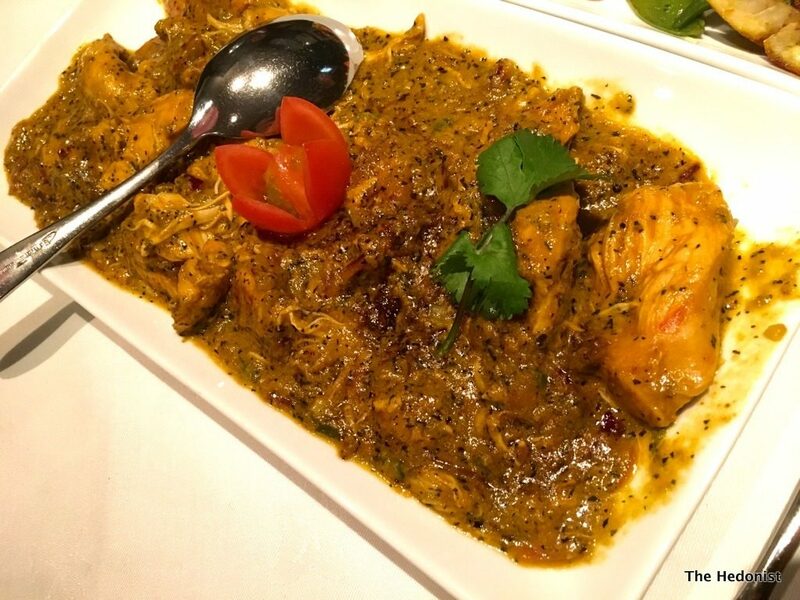 Mains included Tandoor chicken tikka curry slow-cooked and garnished with cream and a Daal Fry – assorted lentils cooked dhabba style. 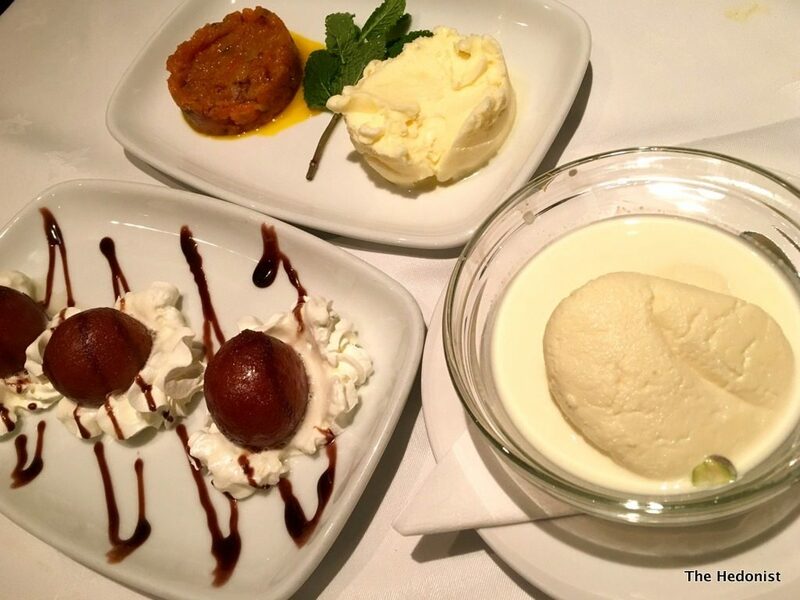 I didn’t make it as far as desserts but a pistachio Kulfi ice-cream, Gaajar Halwa, carrots slow cooked in milk topped with ice cream and pistachio nuts, and a Mango Mousse flavoured with safffron & cardamom rass malai all sounded like the perfect way to end the meal. I ate and drank far too much at Chai Thali purely in the interests of research. 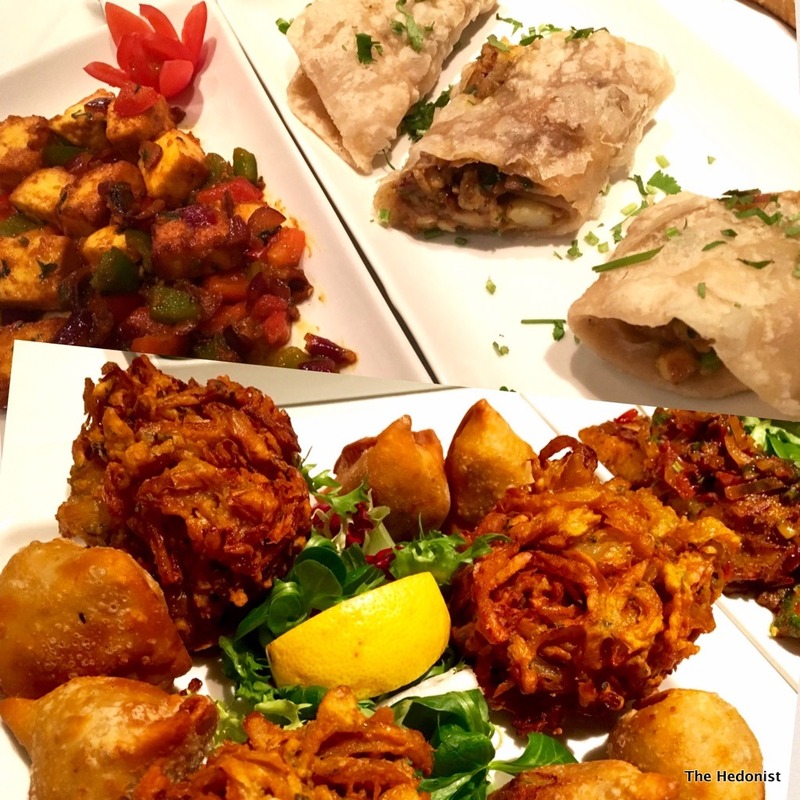 My conclusions dear reader are that if you love small plate dining/sharing and want to try out the latest in Indian street food trends as well as some classics then Chai Thali is an affordable and fun place to do that. In my fantasy world I have the elegance of Dirk Bogarde, drive an Aston Martin and live in Cheyne Walk. This little stretch of exclusivity overlooks the Thames on the north bank between Battersea and Albert bridges, far enough away from the tube to keep the hoi polloi away and close enough to the action to keep me busy. 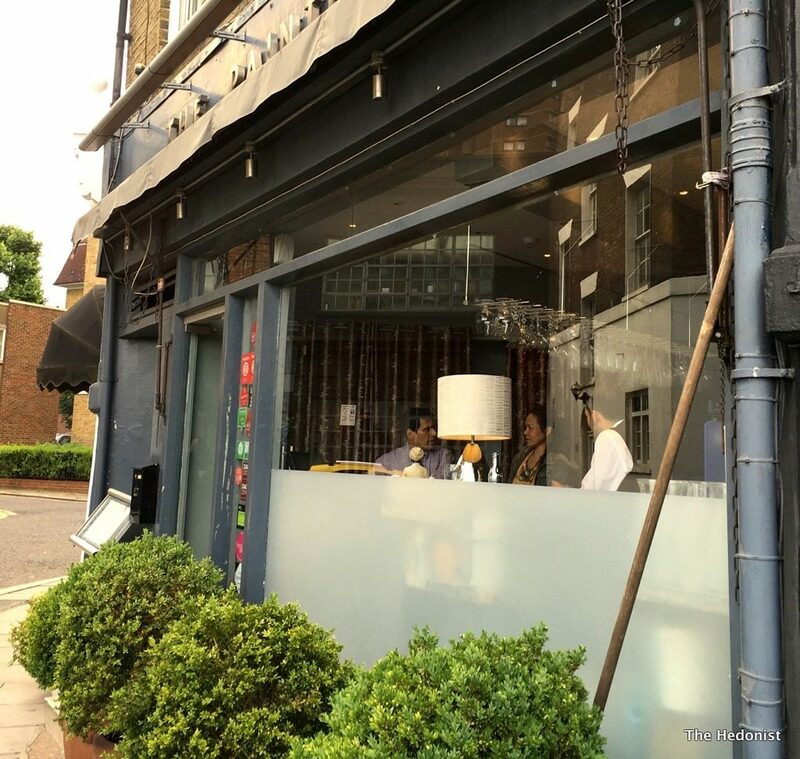 In real life I don’t live anywhere like it but much to my surprise have at least staked a claim by finding a parking space outside Chef-Patron Yogesh Datta’s restaurant The Painted Heron where I have been invited to review the new a la Carte menu. 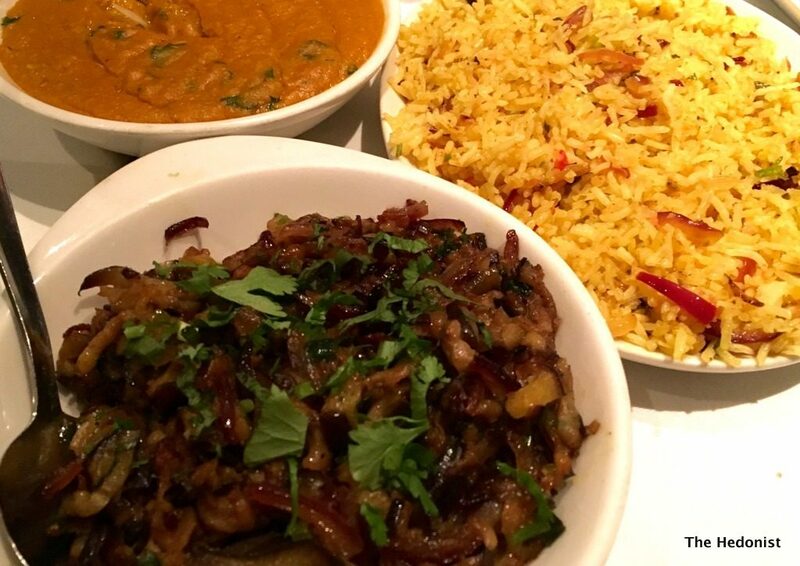 I have previously reviewed Yogesh’s Indo-Chinese City outpost Bangalore Express which does a very good line in upmarket street-food but despite driving past The Painted Heron possibly a million times since it first opened its doors in 2002 I have never visited. 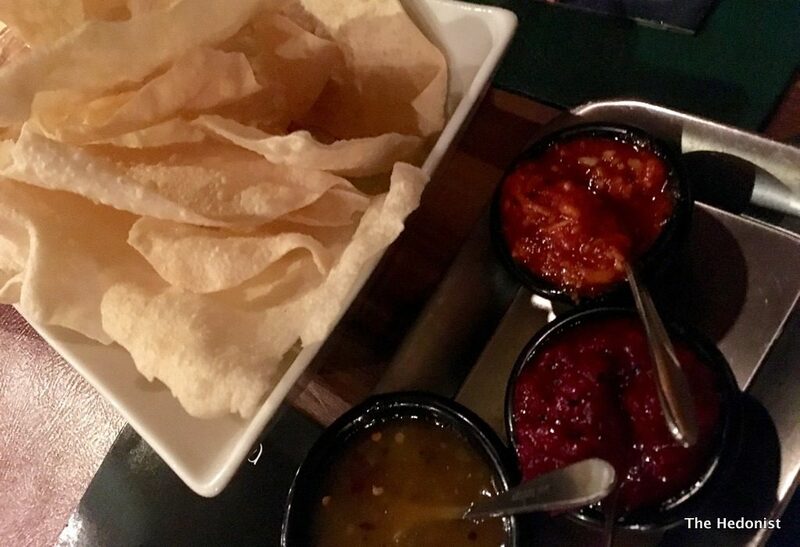 We started the evening with some crisp, freshly cooked Poppadums-chutneys are home-made and unusually flavoured. Mango comes with a hint of cumin, there is a deliciously tart plum version, and the garlic and mint iteration is cool and refreshing. I’m drinking a fruity and floral Gewurtztraminer Reserve, Cave de Hunawihr, Alsace 2012 (£33) that stands up to the spices without being too sweet. 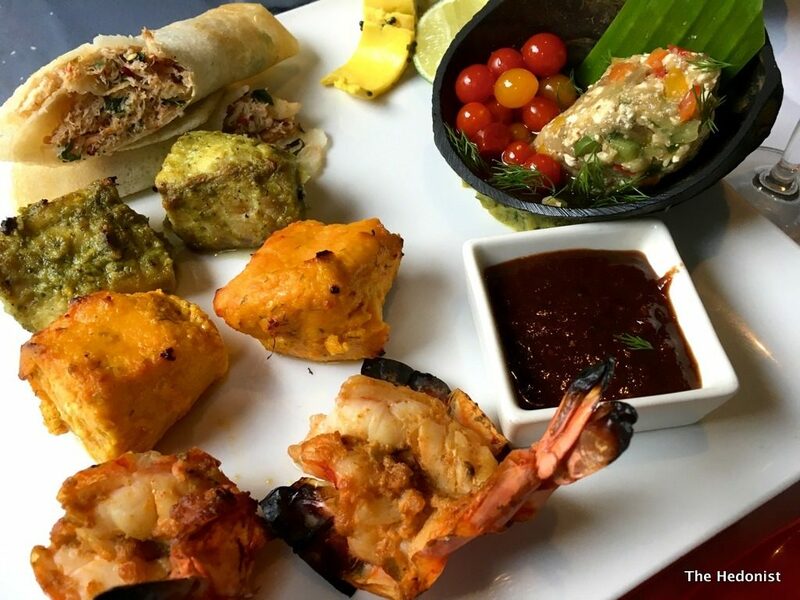 The Seafood Grazing Platter (£25) was an obvious choice for a shared starter-Pollock Fish Tikka was firm-fleshed and not overwhelmed by the spicing, a crab dosa was elegant and light, tandoori prawns were succulent and a beautiful piece of wild pink salmon was beautifully spiced. 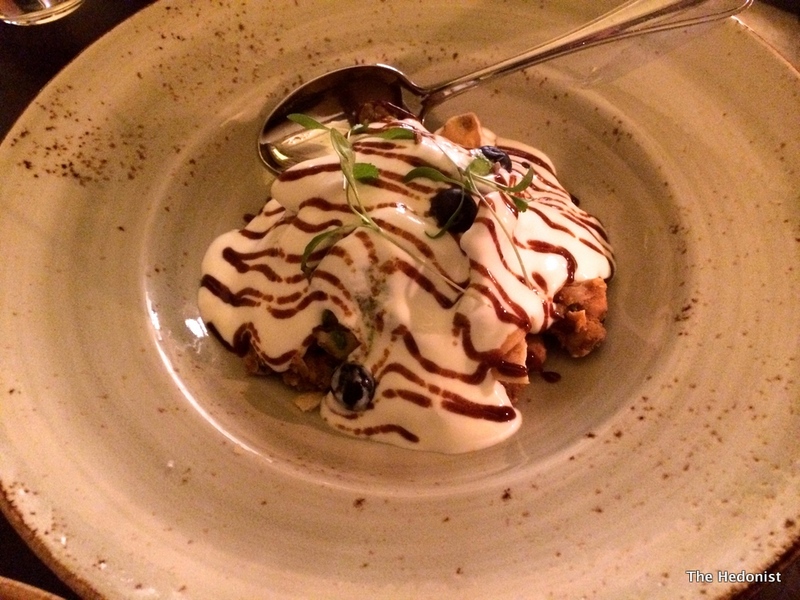 Black cod came with a flavoured chilli crust, onion jam, onion and lentil dumpling, yoghurt (£24.50). The sweetness of the fish was intensified by the heat of the chilli creating a real depth of flavour, soothed by the yoghurt and jam. 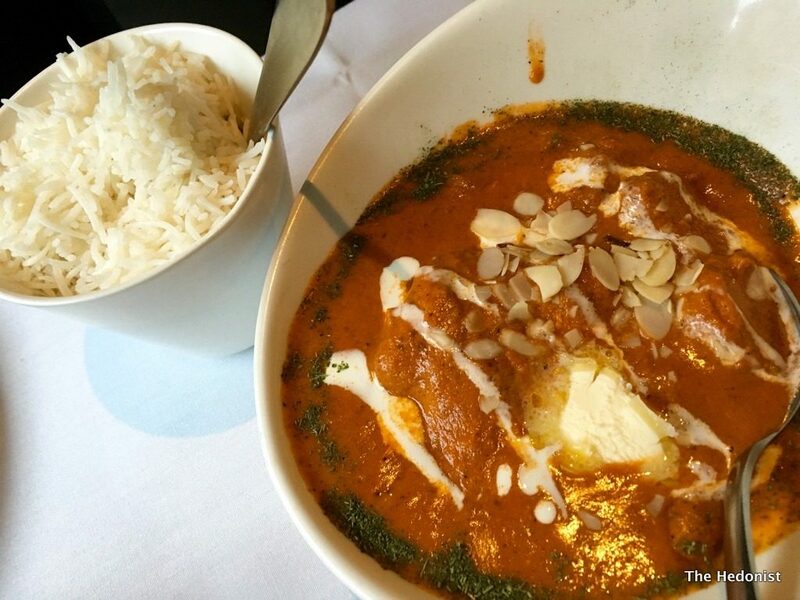 Chicken tikka, almond and tomato curry with clotted cream (£14.50) was rich, creamy and tender-a deluxe take on the standard curry house dish, and the accompanying Basmati rice (£3.50) was fragrant and flaky. Broccoli, cauliflower, sugar snap peas poriyal (£6.50) was delicious-fried veg in a luscious coconut sauce with just a hint of burn! Masala potato, sweet potato and broad bean mash (£6) was a spicy starchy heaven and perfect for mopping up the poriyal sauce. 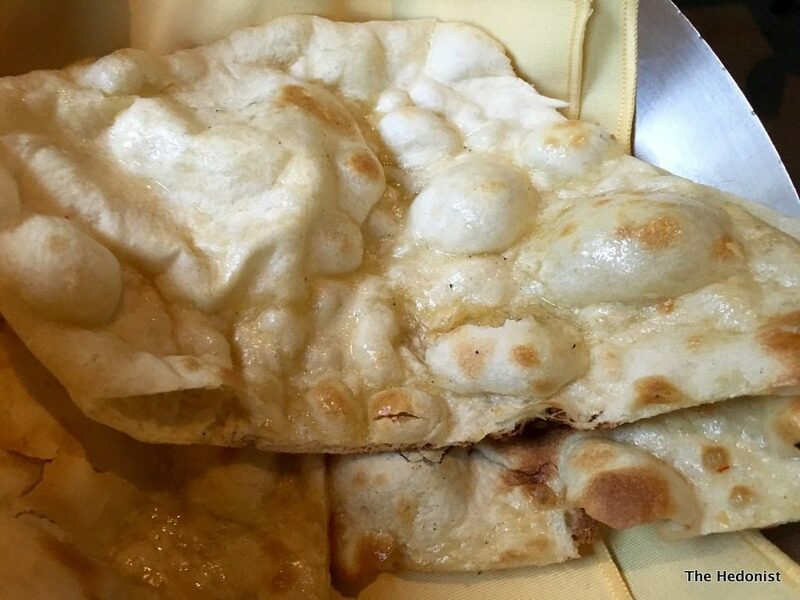 Hot Naan bread (£3.50) came straight from the oven, perfectly blistered and puffed up. 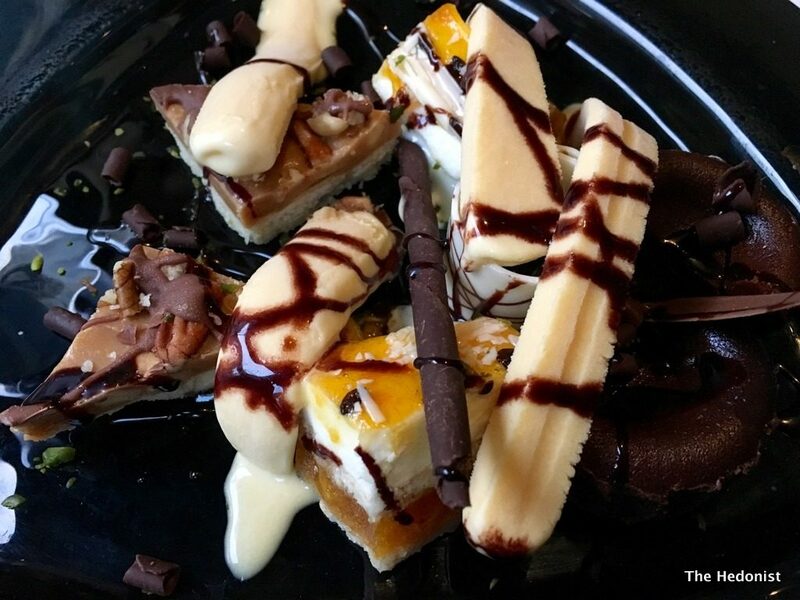 We were brought out a mixed plate of desserts to try out; mango cheesecake, chocolate molten pudding, salted caramels and nut slice with coconut cream all impressed though we were pretty full by this time! In my fantasy world the cool,understated elegance of The Painted Heron would suit me fine and in the real world I’d like to see Yogesh Datta’s prize-winning restaurant getting a little more attention. The food is innovative both in use of ingredients and techniques but without compromising the intensity of heat and spice that creates its character and in these hot summer months with the newly opened Heron Terrace for Alfresco Dining there really is no excuse for not going. 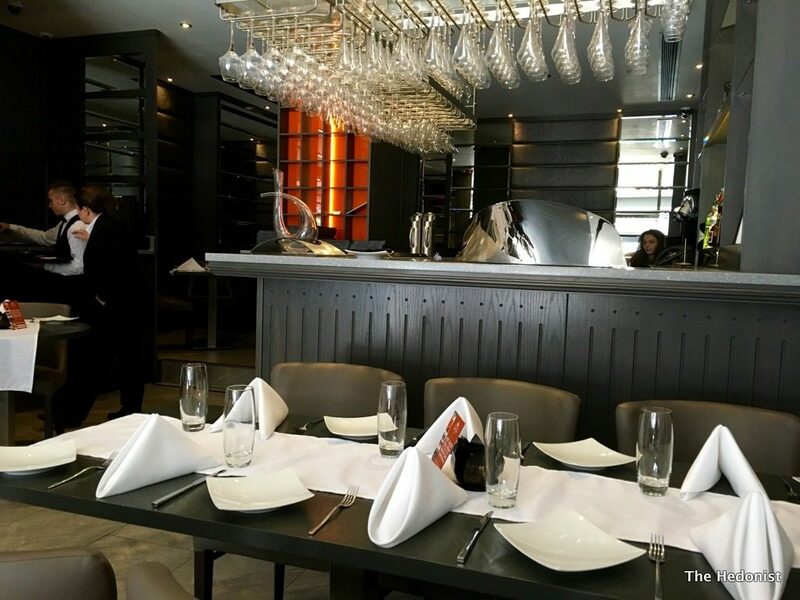 Bangalore Express is the City outpost of Chef-Patron Yogesh Datta, also proprietor of the award-winning fine dining Indian restaurant The Painted Heron in Chelsea. 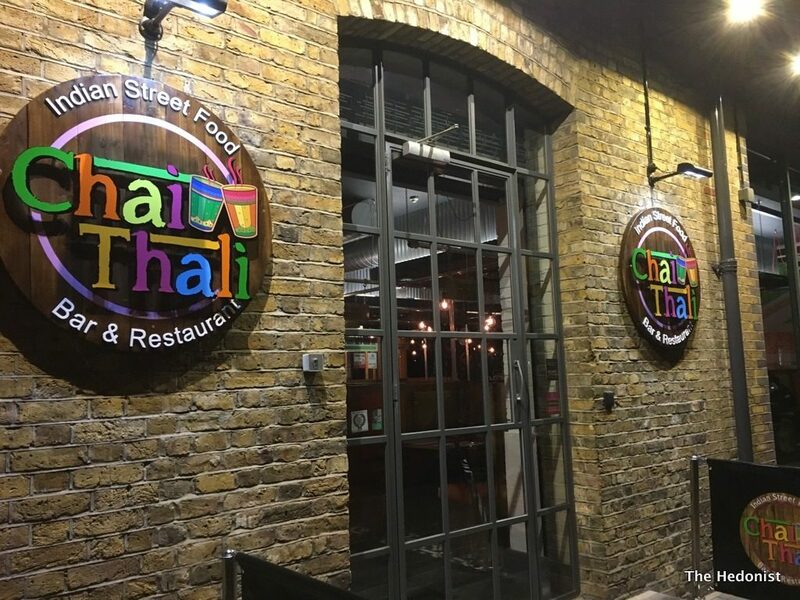 Sitting opposite Leadenhall Market the restaurant has an exciting looking new menu slanted at the busy City crowd and I have been invited to review. 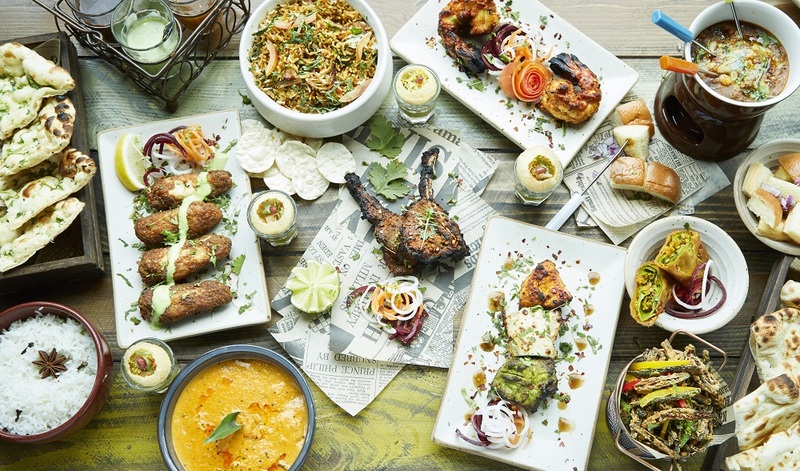 There are some intriguing elements including Indo-Chinese dishes such as Chilli Squid and Lollipop Chicken, a “Build Your Own Curry Plate Matrix” , Skinny Curry Plates and an Indian Breakfast Menu. 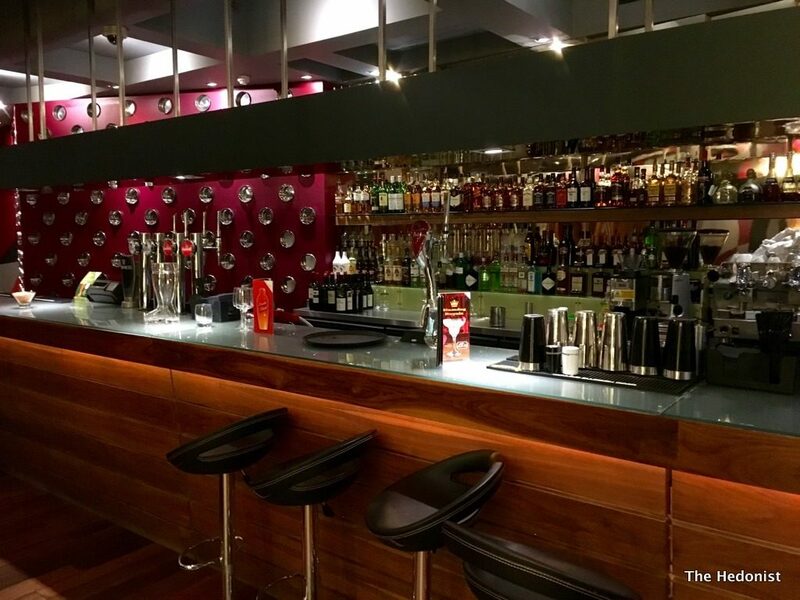 Bangalore Express has an upstairs bar with a capacity of up to 60 covers offering canapés and cocktails and on a hot and sultry summer’s day a well mixed Mojito (£7.80) seems in order. 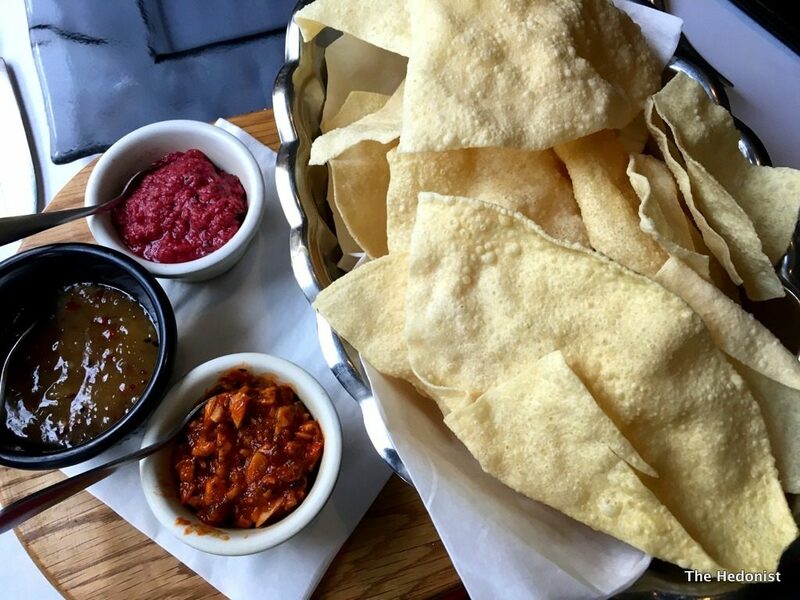 Whilst looking over the menu crisp poppadums arrive with delicious home-made garlic, beetroot and mango chutneys (£3). 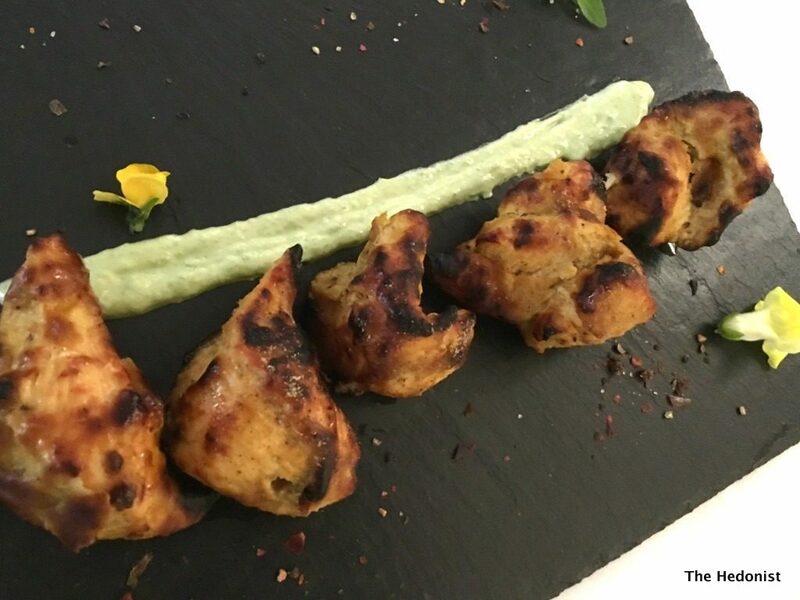 From the small plates menu we try the Fish Tikka (£7.50)- deliciously meaty chunks of fish cooked in a yoghurt and spice marinade with a mild chilli kick. 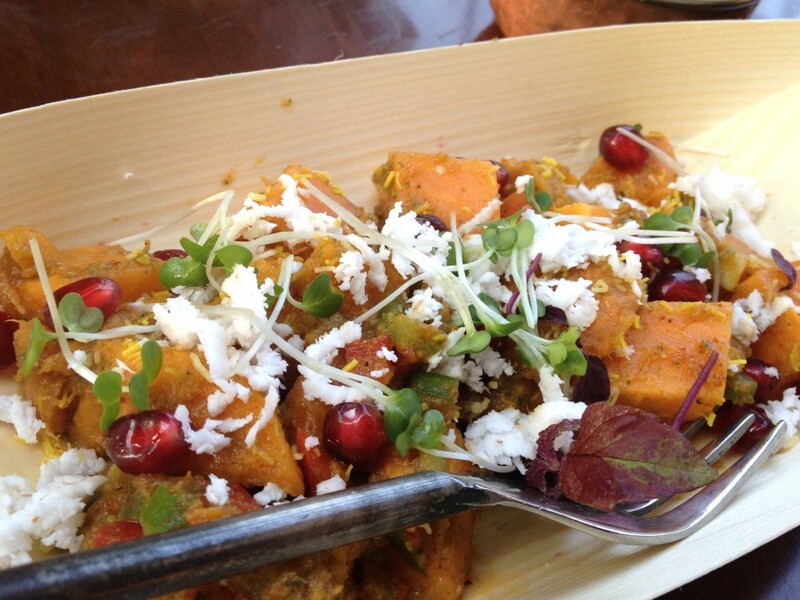 Aloo Chaat (£7.50)-a potato, sweet potato and chickpea salad-had the characteristic spicy crunch of this classic street food dish blended with the sweet-sour tang of tamarind. Vegetable Manchurian (£7.50) came from the Indo-Chinese section of the menu. 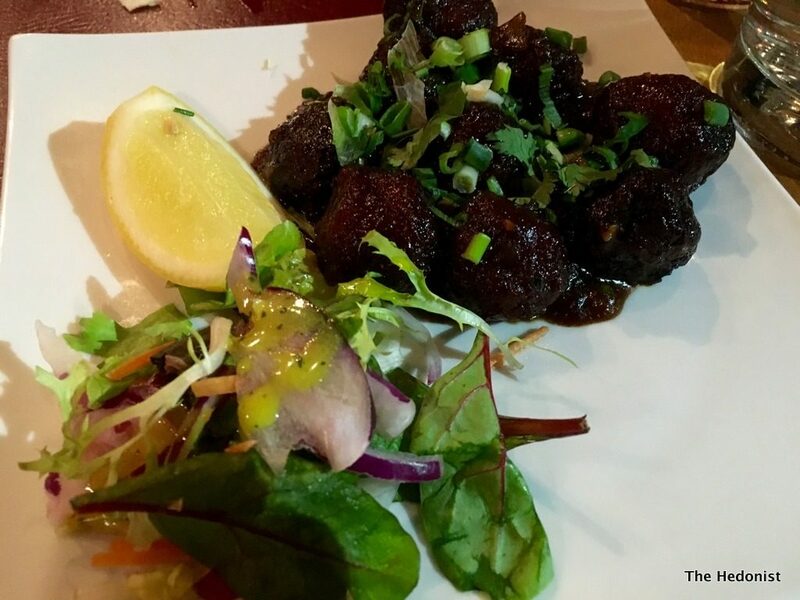 Deep-fried balls of broccoli, cauliflower and paneer are served in a tangy soy based brown sauce. 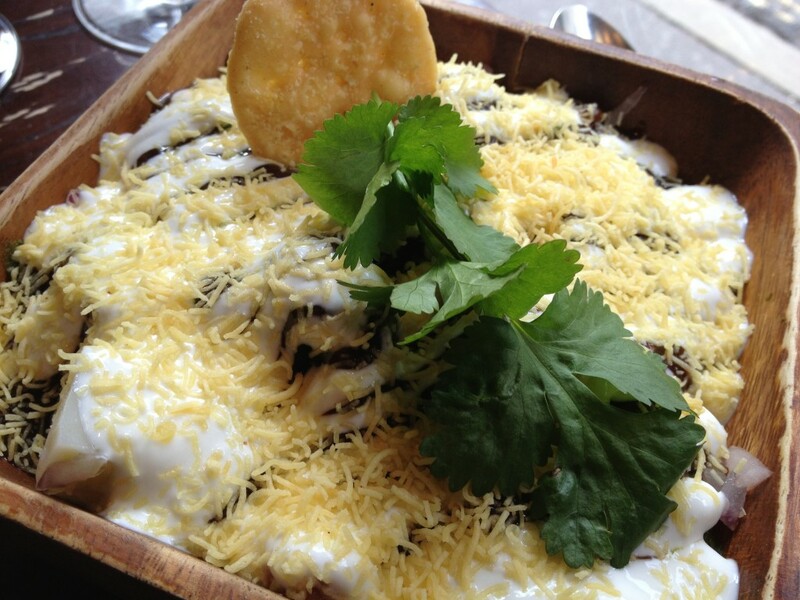 This is one of those irresistibly tasty dishes that you just want to eat more of. Where do I get a bus to Manchuria? 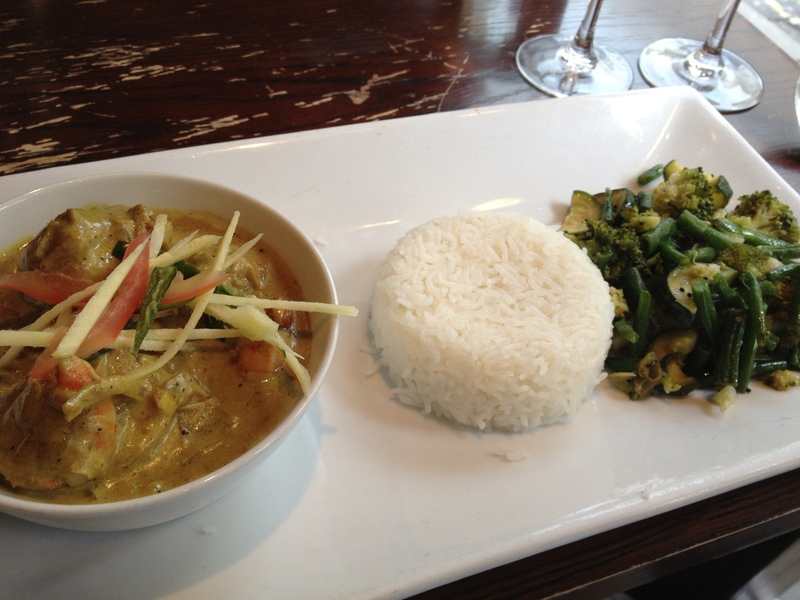 Prawn and courgettes in hot and sour Goan curry (£18.50) used chilli and tamarind to deliver a classic Goan experience-it was definitely hot but not at the expense of flavour. Not for the faint-hearted though! 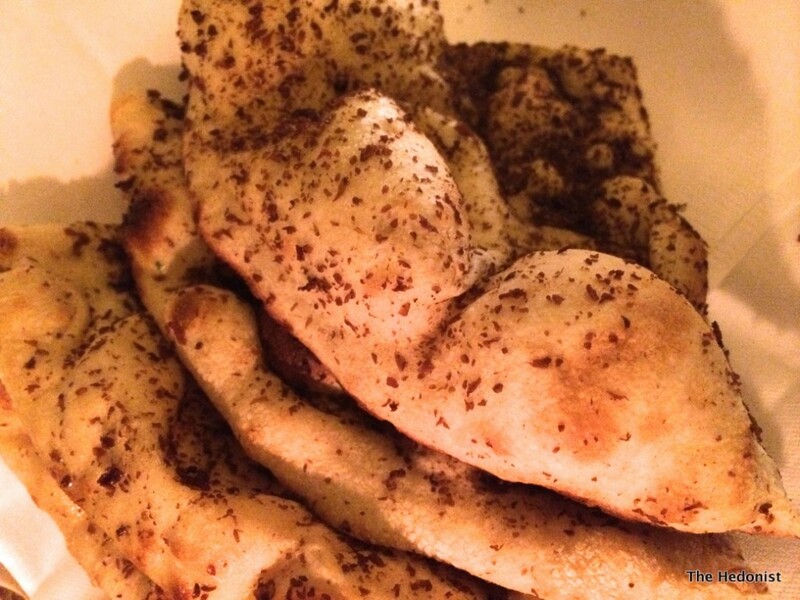 Garlic studded naans arrived hot from the oven flecked with tiny shards of the pungent allium (£3.50). 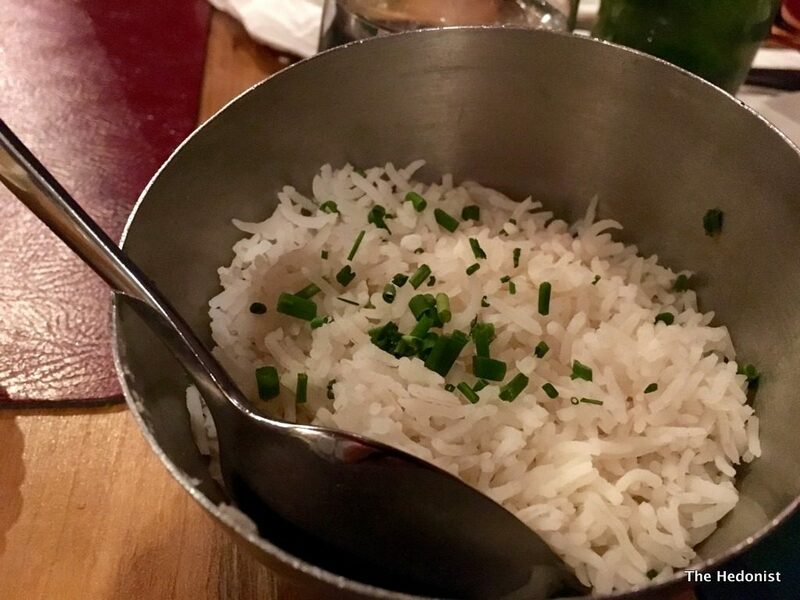 Basmati Rice (£3) was perfectly cooked, flaky and full of flavour. 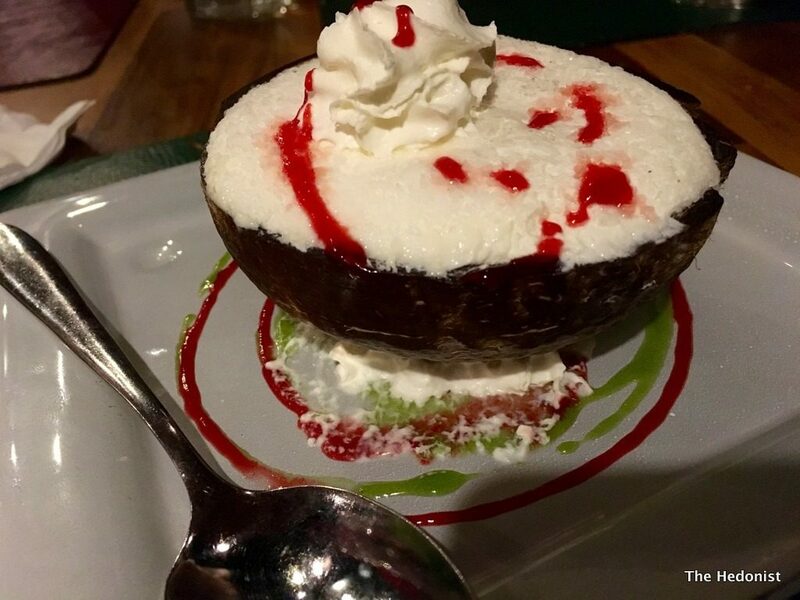 I love the cooling quality of coconut ice cream here served in a half- shell (£4.50). For a sweeter option creamy cheese cakes were doused in mango cream (£5.50). 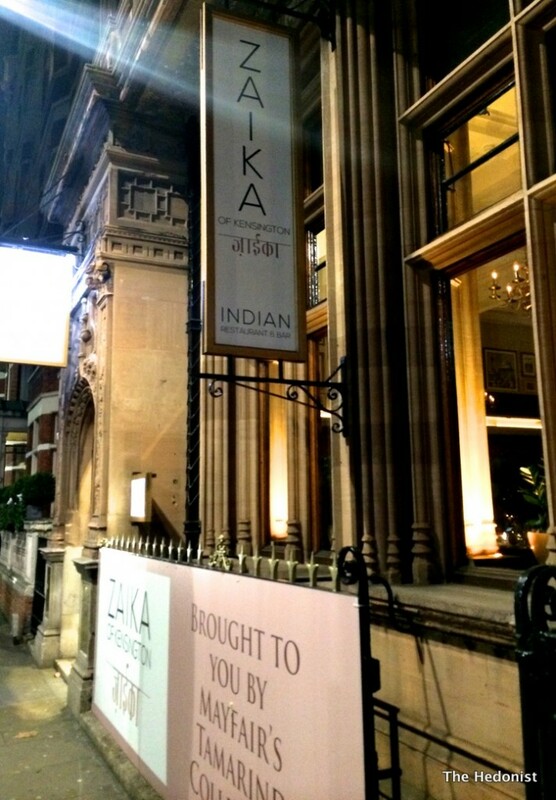 I’m really excited about the diversity of Indian restaurants that we now have in London. 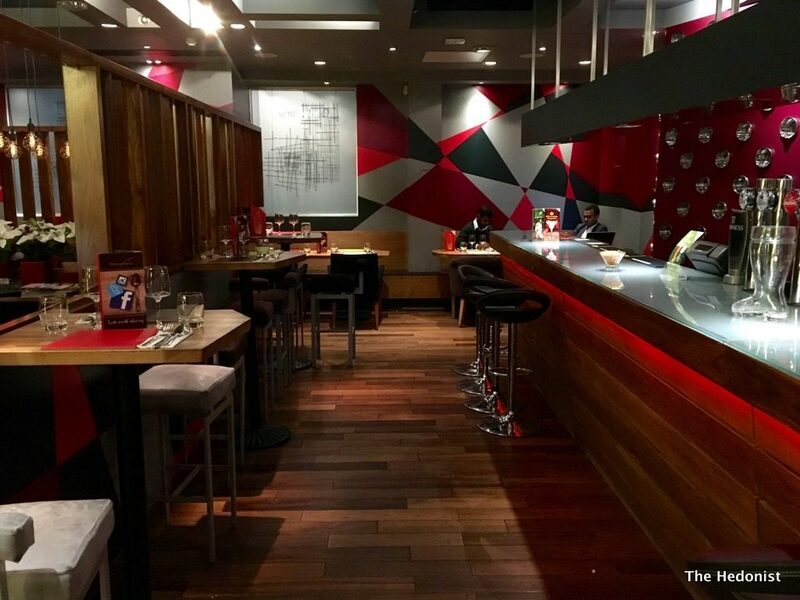 Bangalore Express does an excellent job at the ‘fun dining’ end of the spectrum with a wide variety of dishes you actually want to eat and a menu that reflects the flexibility and informality of contemporary restaurant going. There are certain parts of London that continue to surprise me. 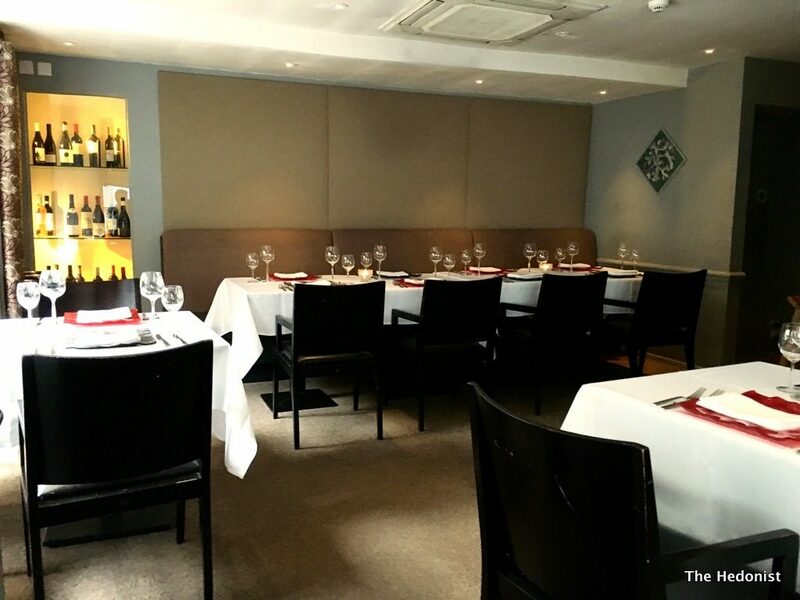 Away from the retail bustle of Kensington High St there is an unexpectedly idiosyncratic posh urban village of smart flats, houses and mews and tucked away amongst the restrained elegance is Chakra, a prizewinning Indian restaurant. 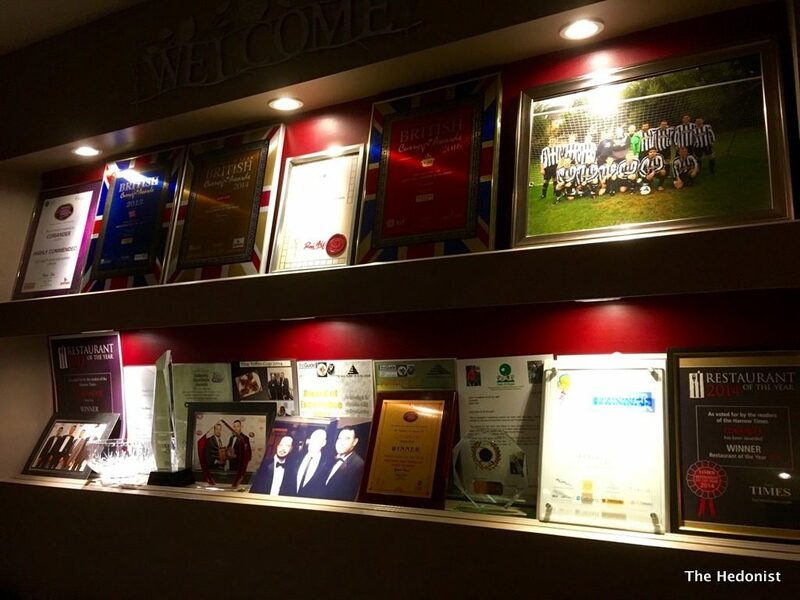 Chakra won Best Indian Restaurant of the Year 2014 at the Asian Business Awards, Top 11 Best Indian Restaurants in the UK 2013 – Tatler Restaurant Guide and the Best New Indian Restaurant in London 2012 -at the British Curry Awards, so clearly has some form. 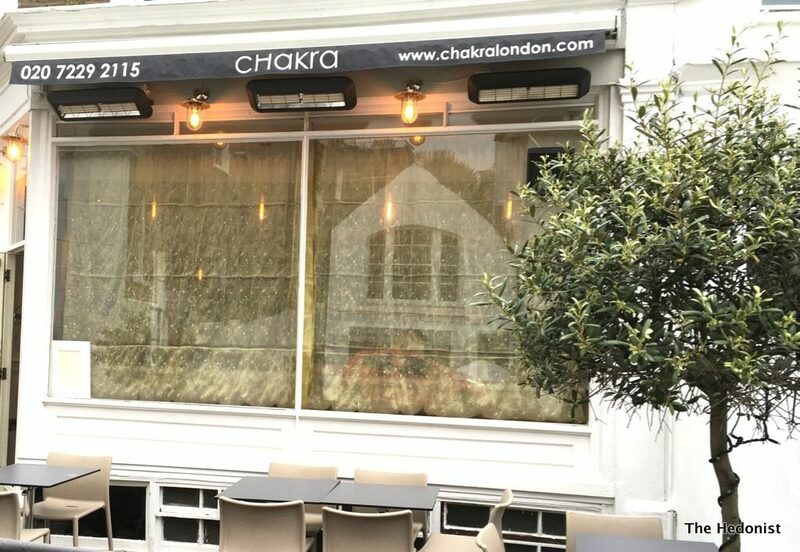 The restaurant has a thriving takeaway and outside catering business, a sector in which they are a major player, so I was astonished on arrival at the restaurant to see its scale as Chakra is the epitome of the small local restaurant. The interior is comfortable, smart and intimate and offers a neutral background for the food to shine rather than overwhelming it. 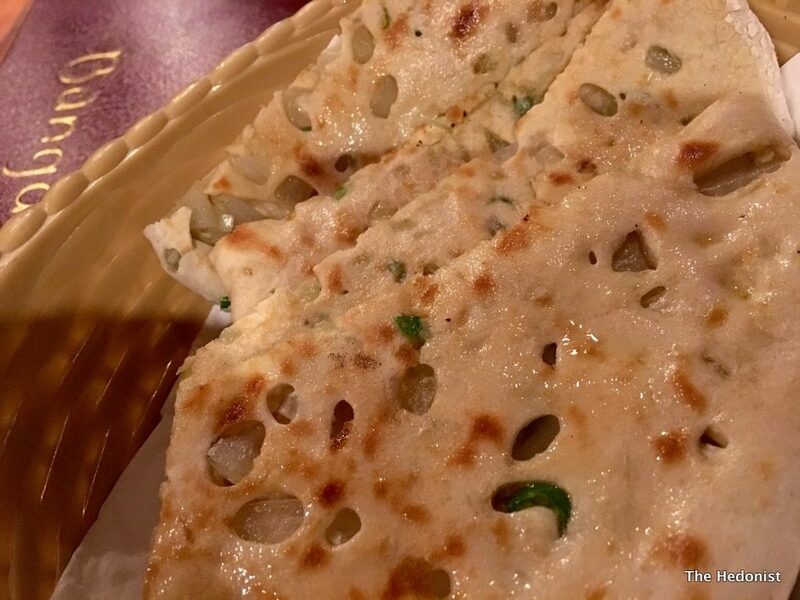 The menu has a focus on dishes based on the traditions of the Royal Maharajah Kitchen ‘inspired by traditional recipes from Punjab and the Northwest Frontier.’ I have been invited to review and am fascinated to see if the gentility of the surroundings has crossed over to the food. 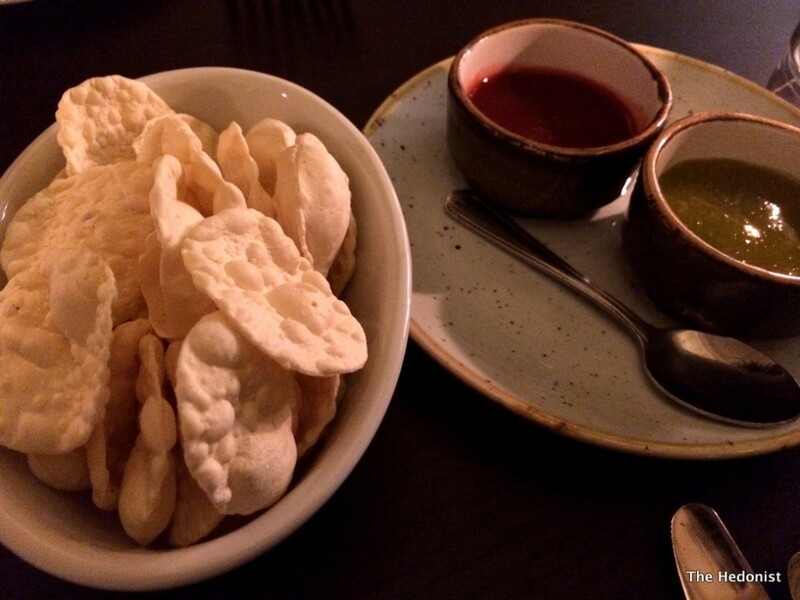 First up were some crisp mini-Poppadums with the sweet-sour tang of tamarind pickle to get the gastric juices flowing. 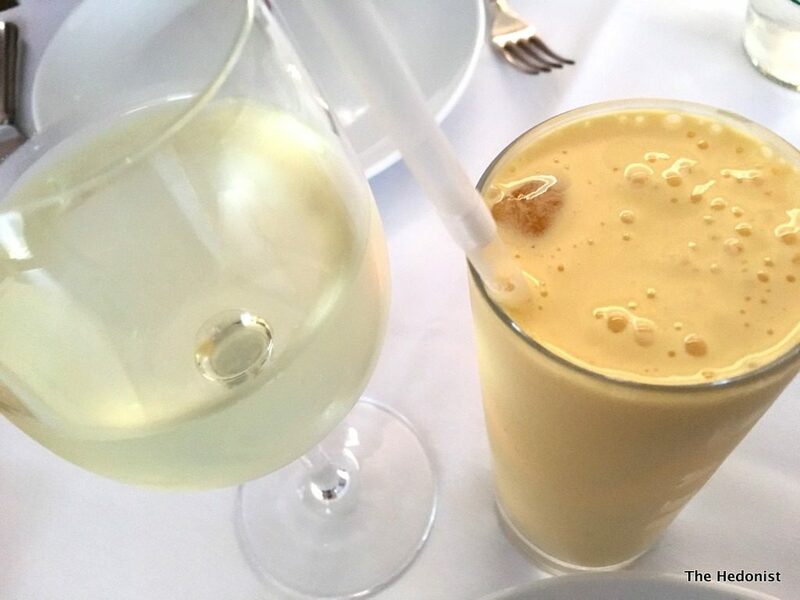 I drank a mango lassi (£6) which was thick and sweet and a glass of Sauvignon Blanc Pays d’Oc (£5.50) from Domaine Bergon which was grassy with a well-balanced acidity. 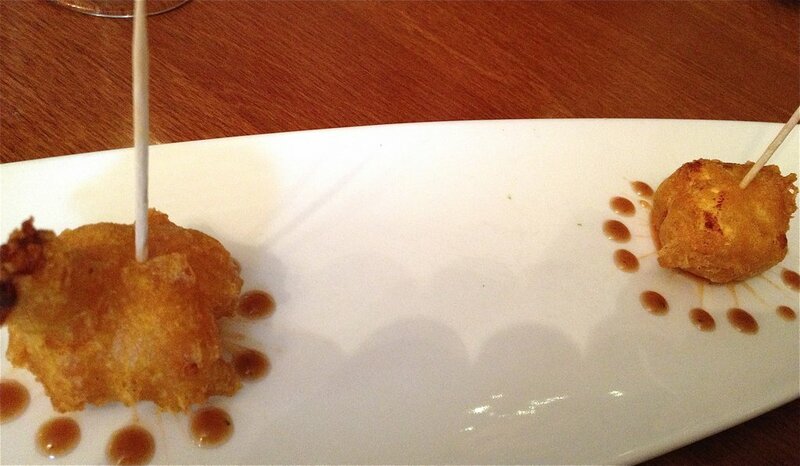 Crispy avocado spheres came with a micro-curry leaf perched on top and a smear of tamarind chutney (£10.50). The outside had the kind of crunch I associate with Japanese Panko breadcrumbs with the interior being a deliciously mildly spiced and warmed avocado. 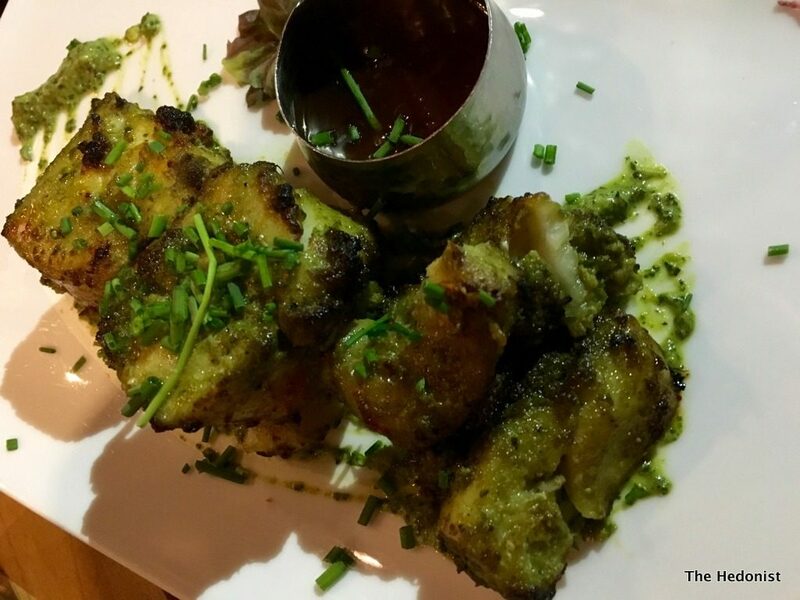 Grilled chicken breast was surprisingly tender with the spiky heat of yellow chilli being cooled by a mint chutney (£10.95). 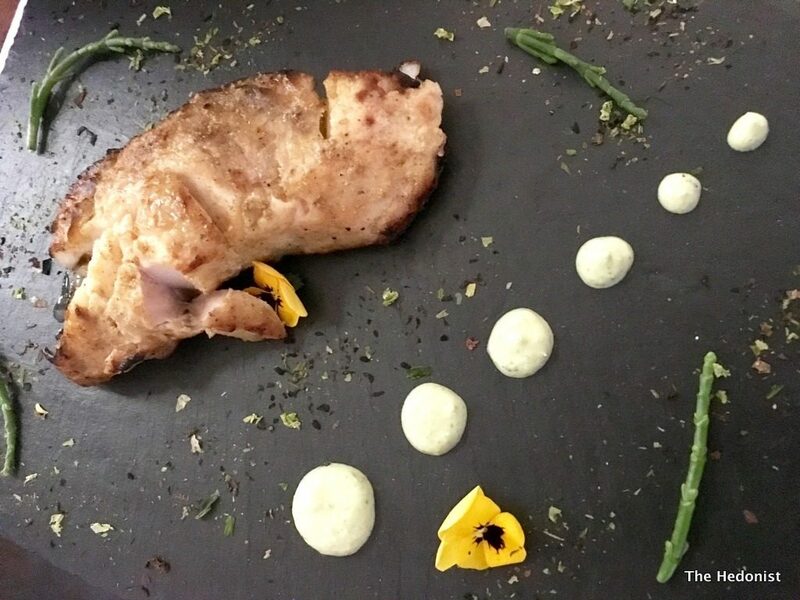 Black cod was cooked in a clay oven which brought out its natural sweetness with saffron and samphire flavours adding earthiness and salinity (£19.95). 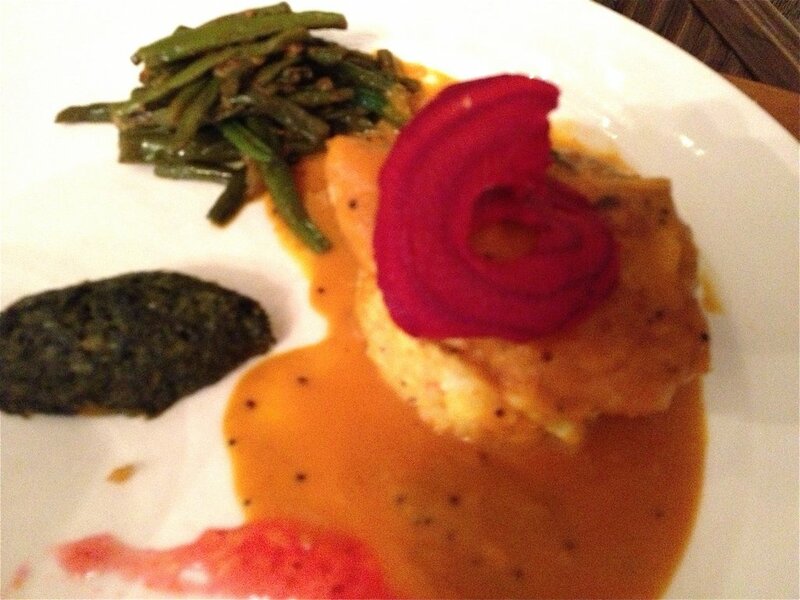 Tandoori sea bass (£16.50) had that deep rich tandoori flavour that I crave. 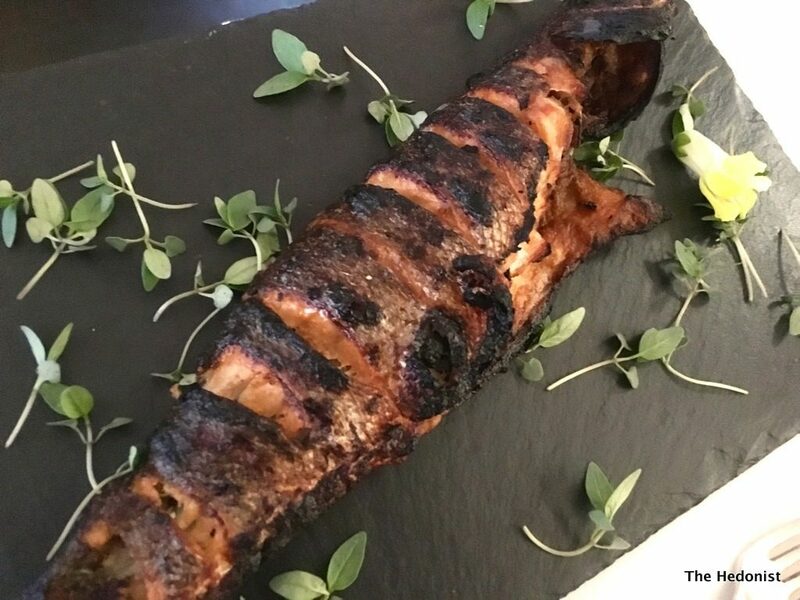 The fish had a deliciously charred skin but wasn’t overpowered by the spices. 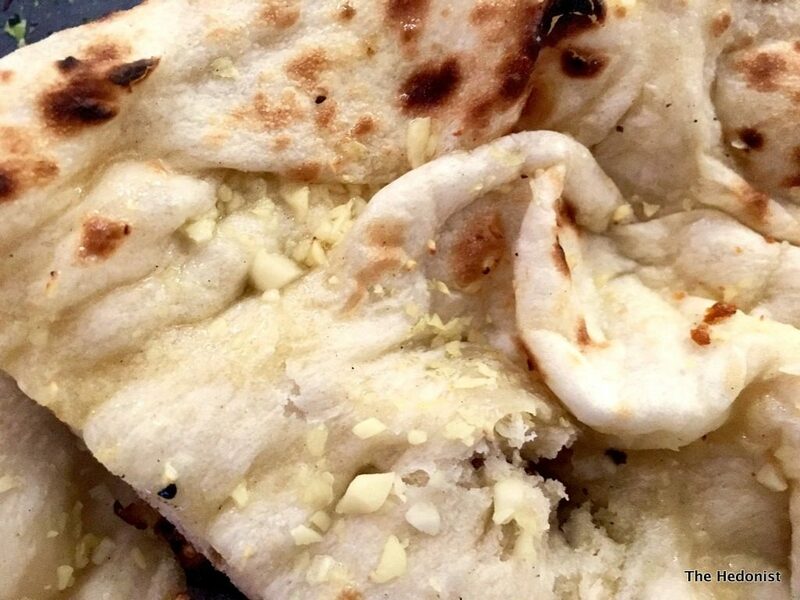 Garlic naan (£2.95) came hot and glistening from the stove and a dish of Basmati rice (£3.95) was beautifully cooked, each grain of the aromatic rice separate from the other. I ate this as a dish in its own right it was so good. 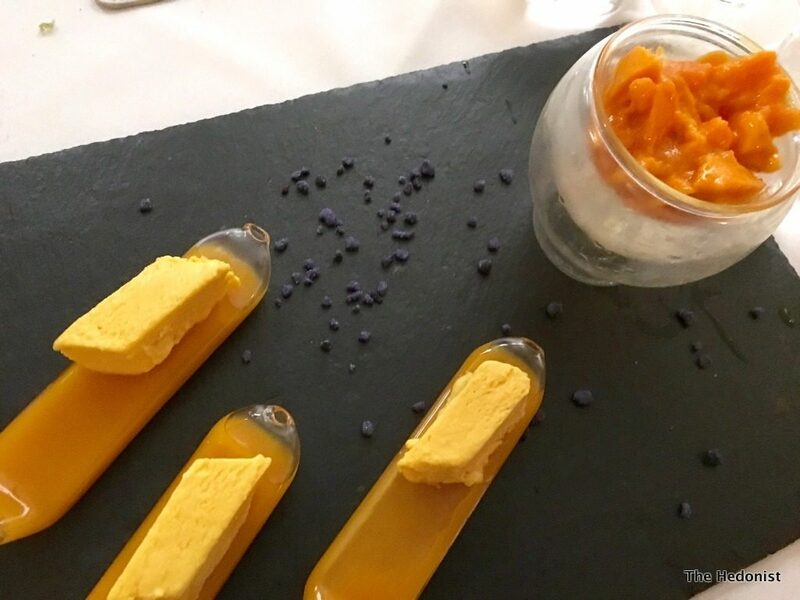 Dessert was a trio of Mango kulfi, fresh mango and mango sauce (£5.75) made with top quality Alfonso mangoes which are the sweetest and tastiest. 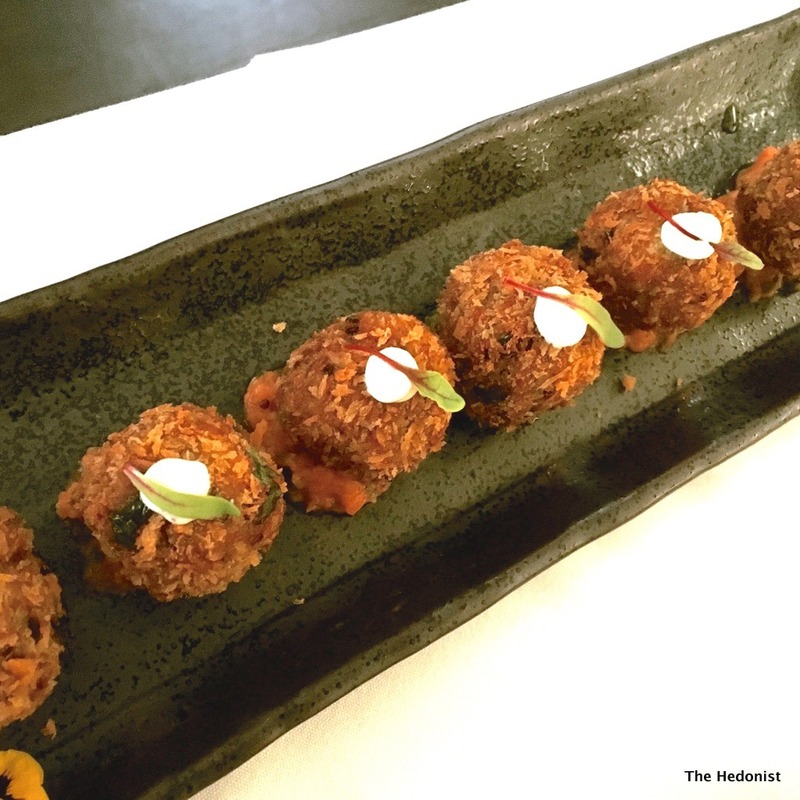 The menu at Chakra makes innovative use of ingredients and isn’t afraid to venture across food cultures into new territories, with the avocado dish almost seems like the ultimate fusion of Nikkei with Indian. 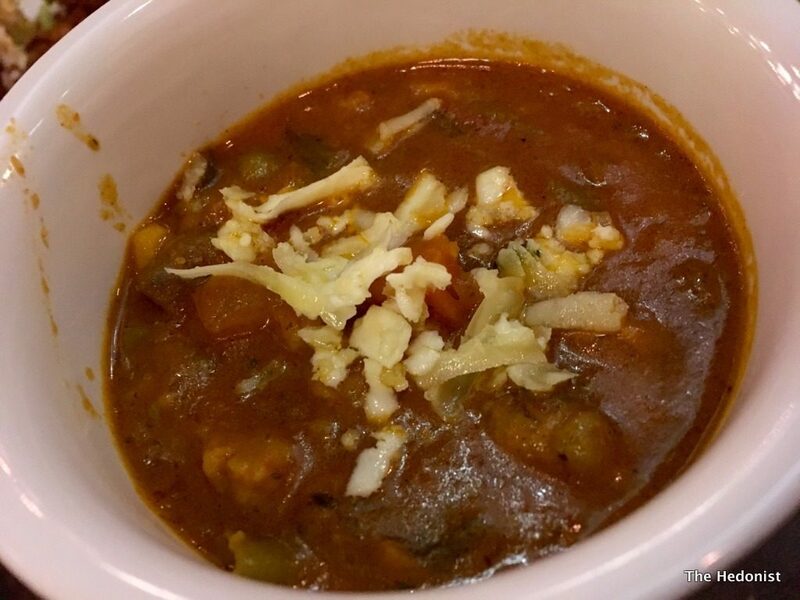 The cooking and spicing has a classical precision without sacrificing flavour. My only caveat would be the lack of vegetables on the menu. With a small terrace it’s perfect for a summer evening’s treat and the soon-to-be-opened basement will be a cosier option in winter. 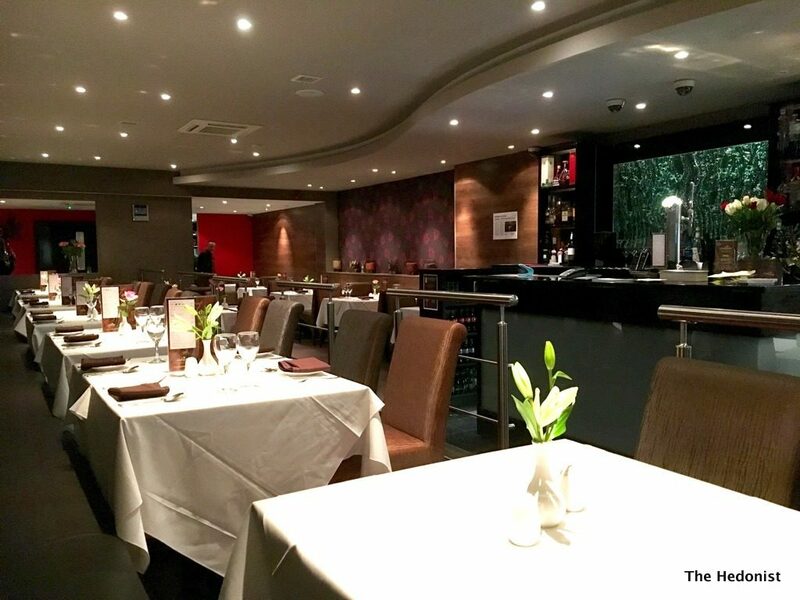 Chakra is well worth a visit if you want to eat refined Indian food in a civilised setting. The Lotus flower is the national flower of India and signifies purity, spiritual awakening and grace. 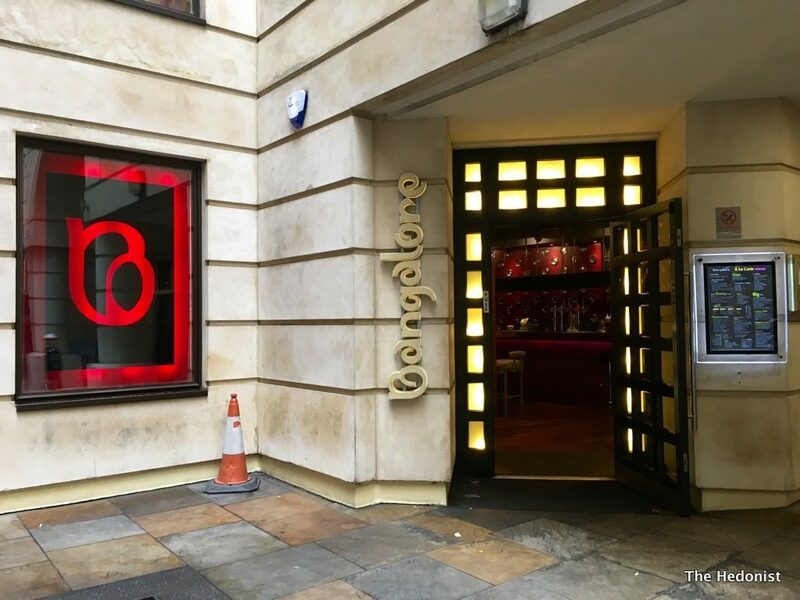 The new 65 seat Restaurant of the same name sits in a part of the West End more associated with the theatre, art and gambling rather than any of those more estimable virtues. I’m hoping for a more decadent experience than the name implies as the restaurant’s team of chefs have worked in some the finest luxury hotels in India, and Bhaskar Banerjee, Chef and Manager of Lotus has a culinary career spanning award winning fine dining Indian restaurant brands such as Bukhara, Dumpukth and Dakshin. 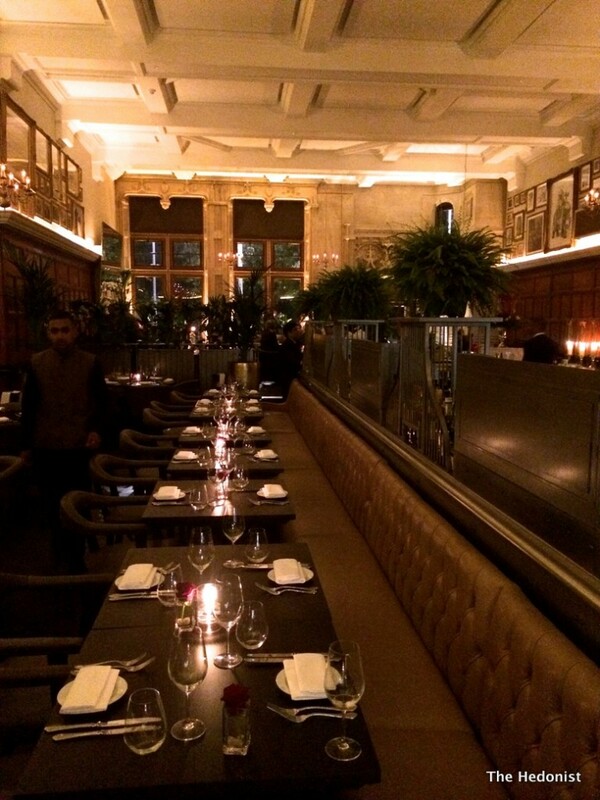 Lotus’ USP is a bespoke wine list with matching wines for each dish chosen by sommelier Debbie Henriques. 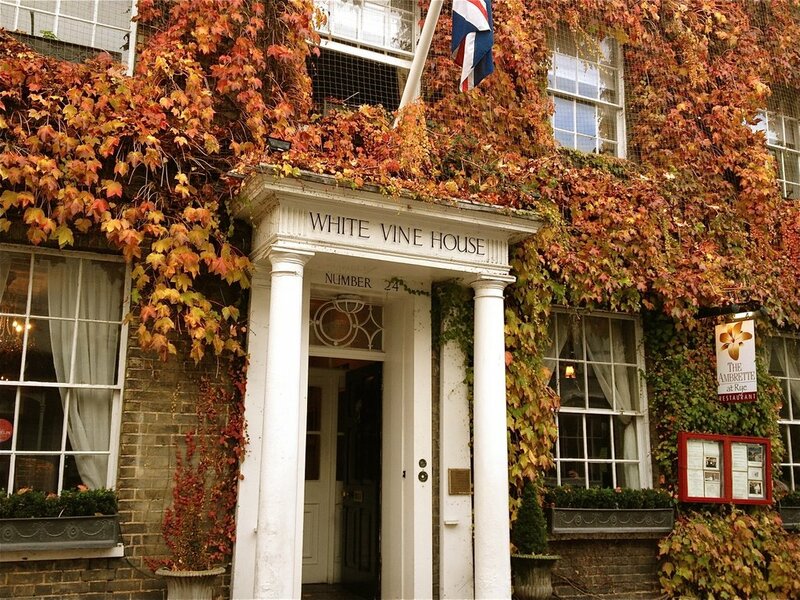 Debbie has a heavyweight CV including Hotel du Vin, Claridges Hotel and Rhodes restaurant at Pimlico Square. 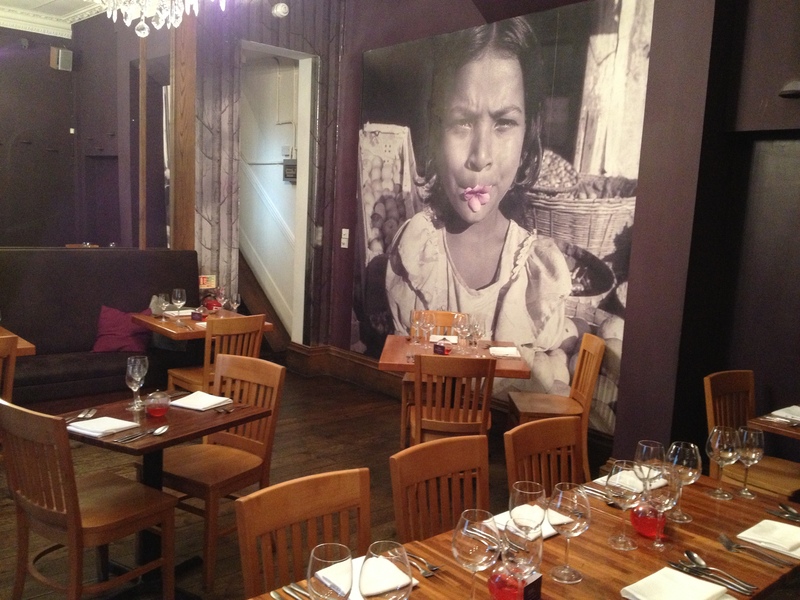 Matching wines successfully to Indian food is really hard so she and the team have a lot to live up to. Debbie starts us off with a glass of Colet Vatua! (meaning ‘What a surprise!’) Extra Brut NV. It’s a sparkling Penedès which is actually a posh Prosecco and an unusual mix of 50% Muscat, 40% Parellada and 10% Gewürztraminer which manages to be simultaneously aromatic and floral but dry. Most often wines paired with spicy food err on the sweet and floral side so this was something of a revelation as it coped beautifully with our yellow lentil broth which was full of coconut and turmeric flavours. 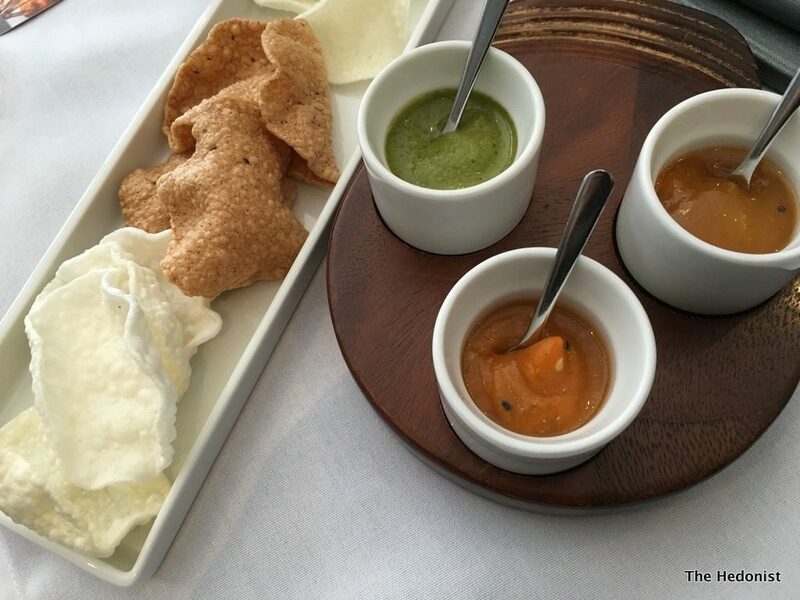 Poppadums unusually came in three ways-rice, millet and potato (£2.75) with three accompanying delicious chutneys, apricot and mango ,roast chilli and green tomato and mint. 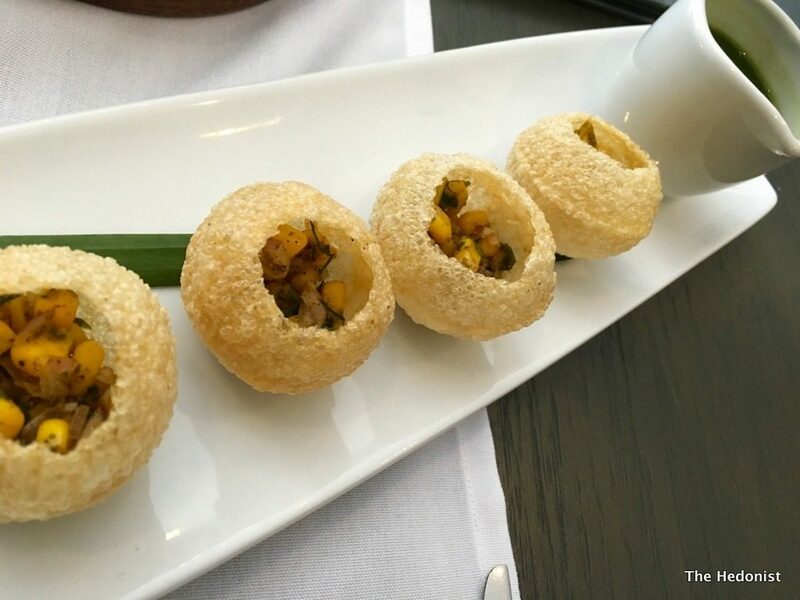 Corn Chaat Golgappa (£3.75) had the fresh clean crunch that you associate with Indian street food-Golgappa is a North Indian version of a panpuri- with the flavour coming from Jaljeera, the cooling cumin, pepper and mint drink and a tamarind chutney. 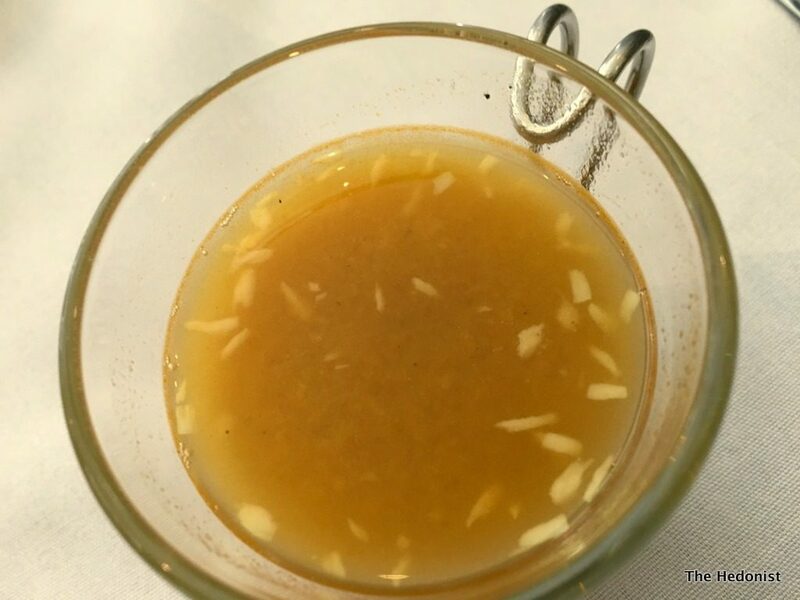 It was fun to pour the Jaljeera into the Golgappa and pop it into my mouth for a taste explosion. 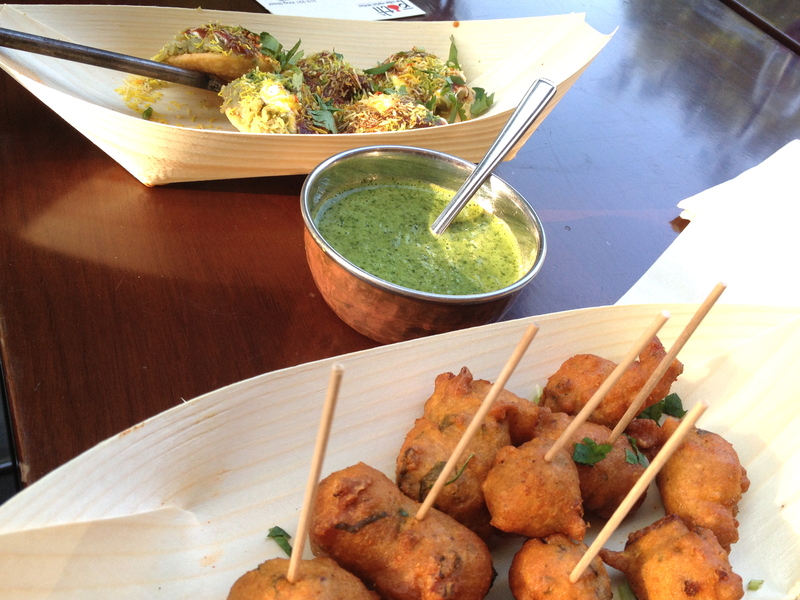 Cod cheeks, bream and tuna were coated with semolina, deep-fried and served with a curry and coriander dip (£8.75). This was a precise piece of cooking that allowed the fish flavours to shine through that was well matched by a glass of citrussy Grüner Vetliner Holzer Austria 2014 (£8.75). 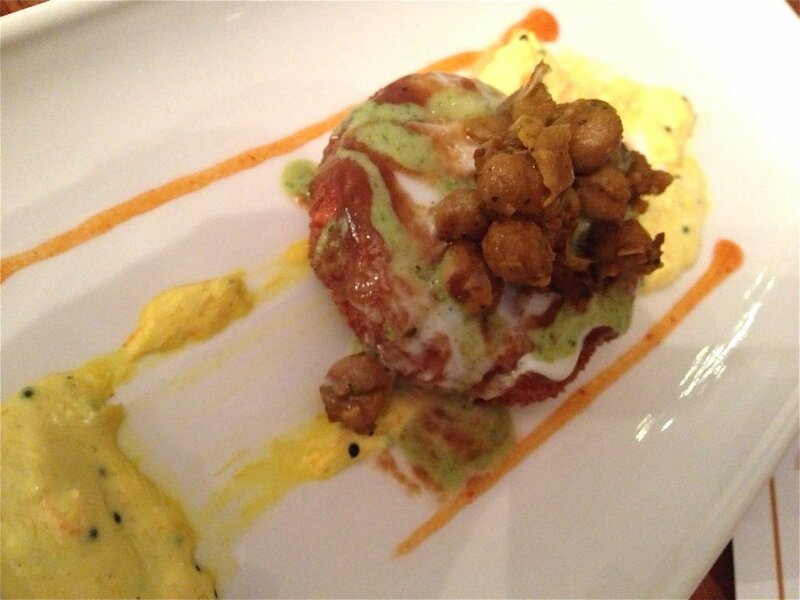 Masala Prawn, Duck eggs and Green lentil wrap (£8.75) was another rich and elegant dish. 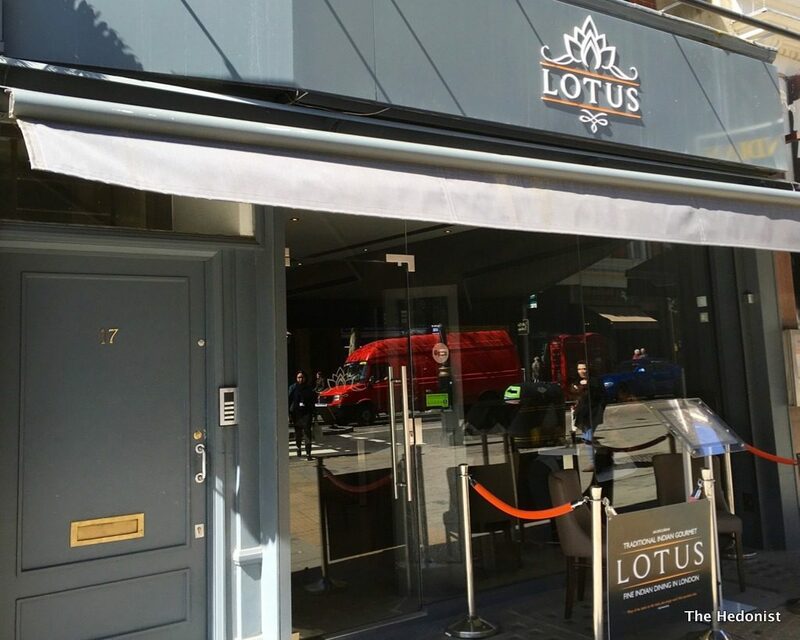 Lotus clearly is not about big shouty flavours but something more refined and subtle. Curried egg and prawn is a classic combination but not something I had eaten in a wrap before and the lentil version was crisp and satisfying. The accompanying Portal Del Montsant Santbru Spain 2010 (£10.75) was full of red and black fruit balanced by a healthy acidity. 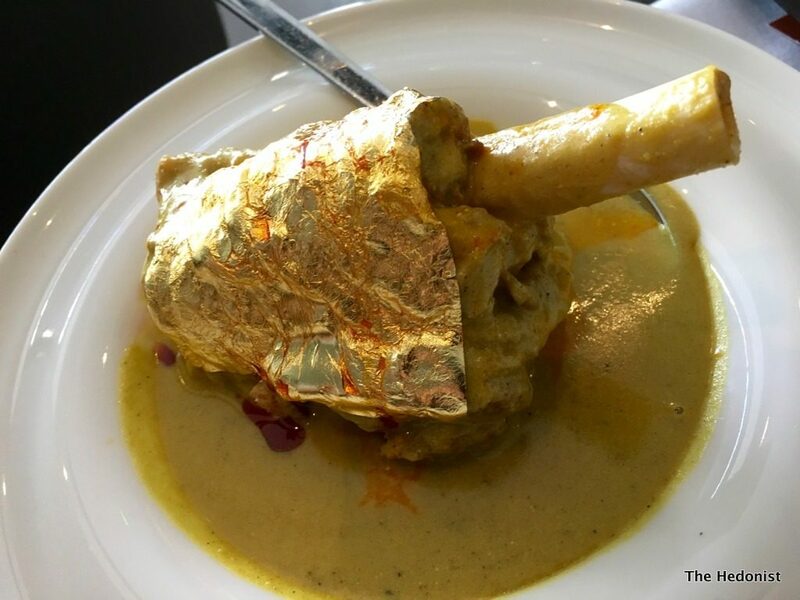 Lotus’ signature dish is the rather bling 23 Karat Gold Lamb Shanks Khorma with roast potato mash, papaya pickle, spices, green cardamom and cashew (£21.75). 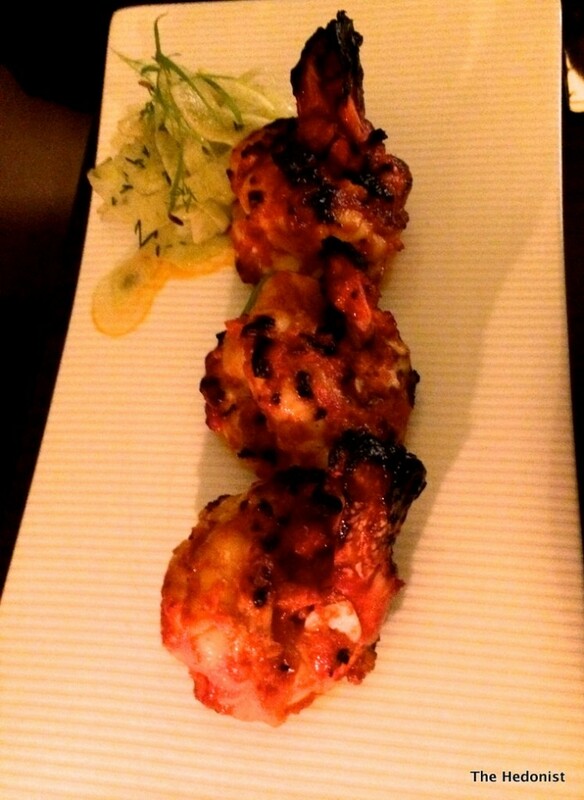 It was beautifully tender and again spiced with lots of layers of flavour. The red wine Graciano, Vina Zorzal, Navarra 2013 (£8.75) was similarly complex and spicy. 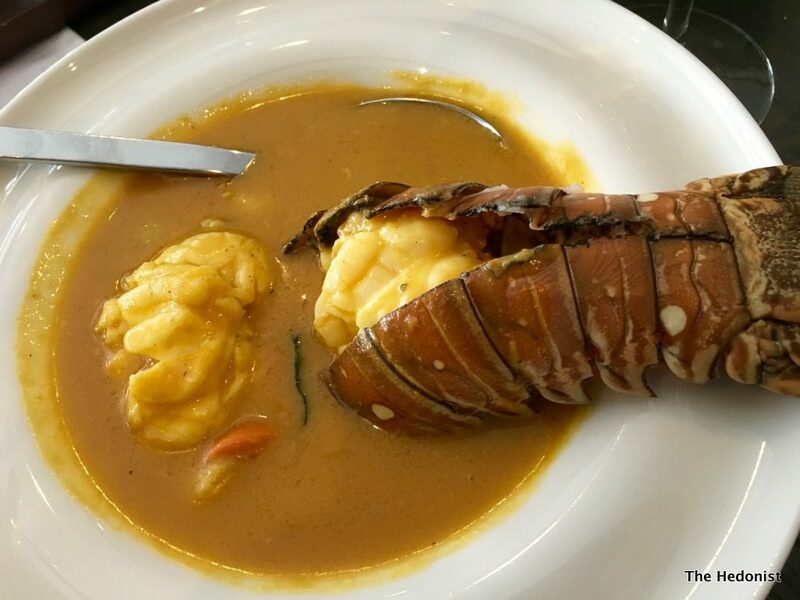 Lobster tail and Queenies, ginger, curry leaf and coconut curry was another elegant dish that displayed an almost French classical sense of restraint. The lobster had great texture and flavour and the saucing was sublime. Domaine Saint Hilaire 2013 (£10.75), a chardonnay from the Languedoc had a chalky minerality that was a delicious counterpoint. Saffron and green peas rice (£4.75) was a delicious bowl of spice and texture. Black lentils had simmered overnight with Garlic, Tomato, clarified butter and cream. 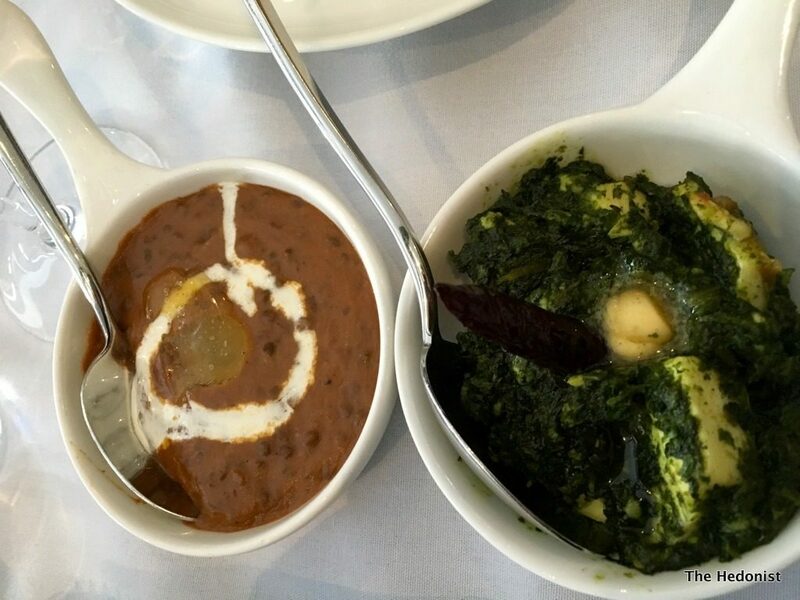 This was the best daal I have ever eaten with the earthy, nutty quality of the lentils to the fore and the dish of Paneer and spinach was rich and vegetal. 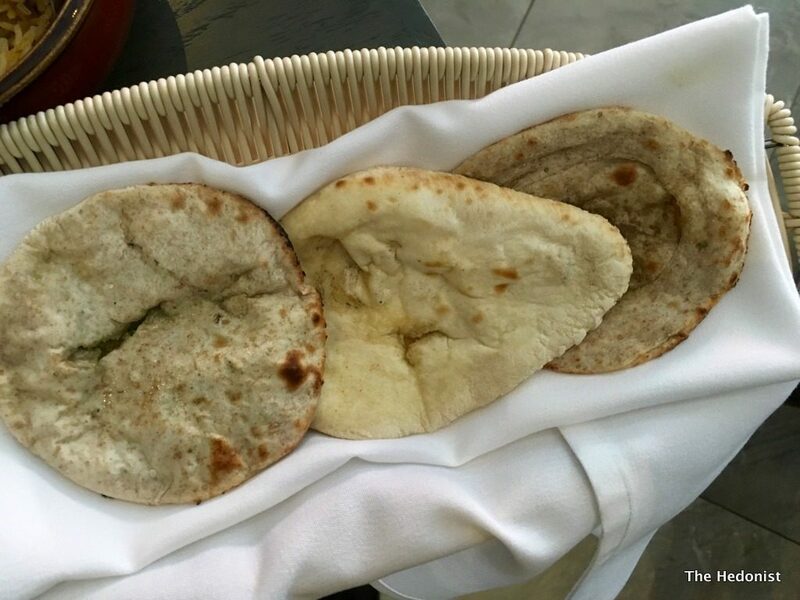 A bread basket (£3.75) was made up of freshly cooked naan and roti. 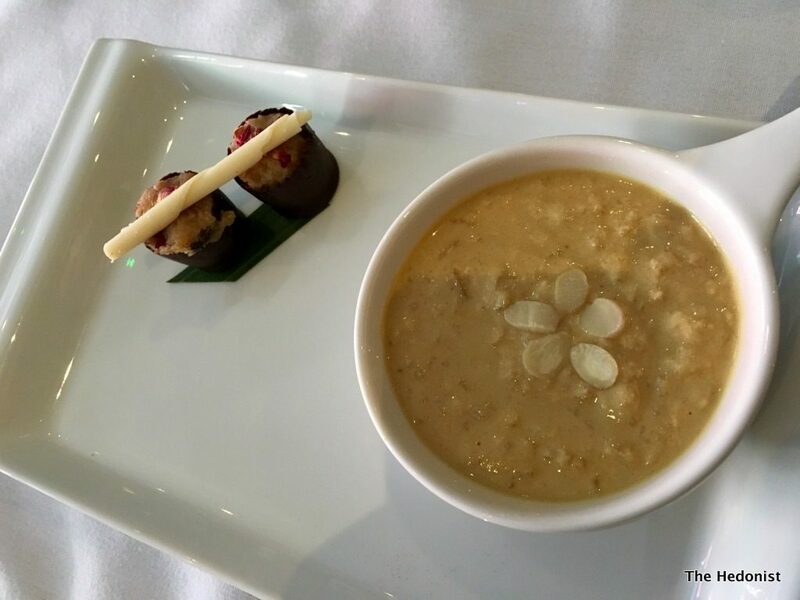 Almond Kheer (£6.75), Parsnip cigarillo and date Jaggery featured the almond rice pudding given some sweetness by the cane sugar Jaggery and the glass of Chateau Delmond (£8.75), a classic honeyed Sauternes. 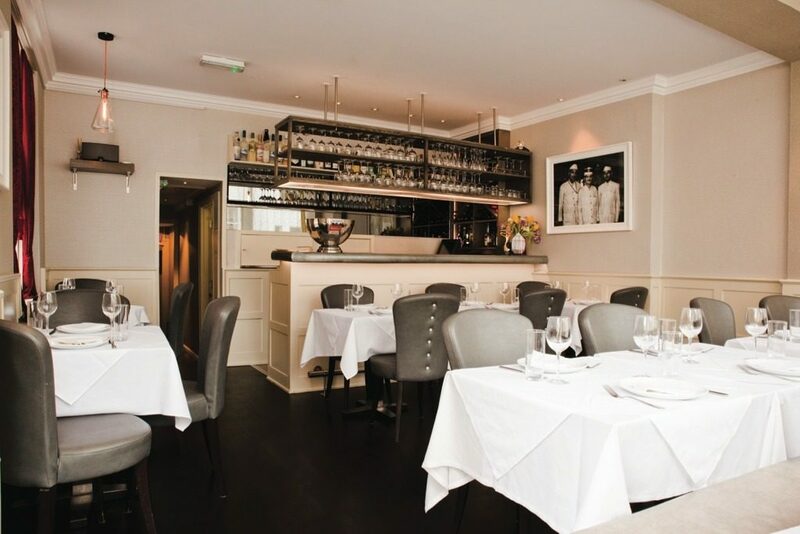 Lotus offers refined Indian fine dining on a par with London’s top Indian restaurants such as Gymkhana or Benares. 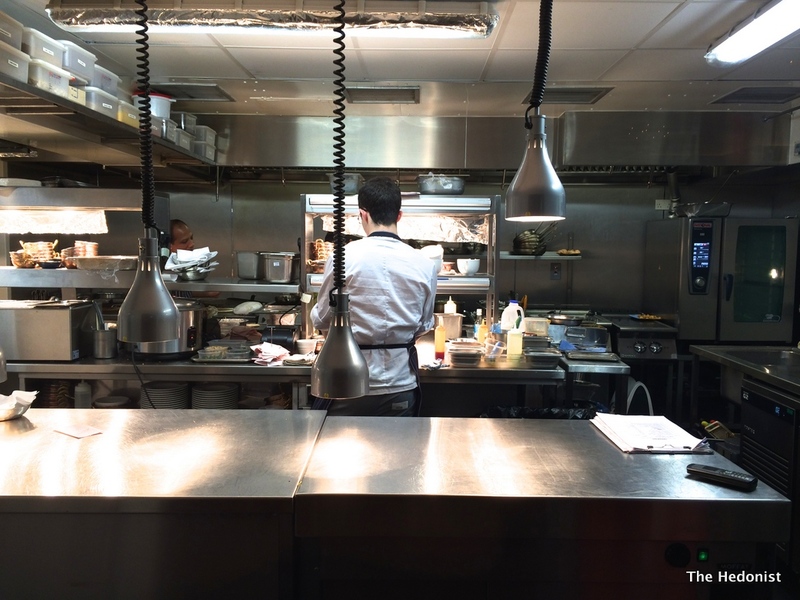 My only criticism is that in today’s world it is important to have a focussed marketing offer, creating a narrative around the food that a UK fine dining audience can buy into. The the wine matching is definitely a major plus and once the restaurant finds a way of projecting outwards I’m sure it will be a great success because it deserves to. 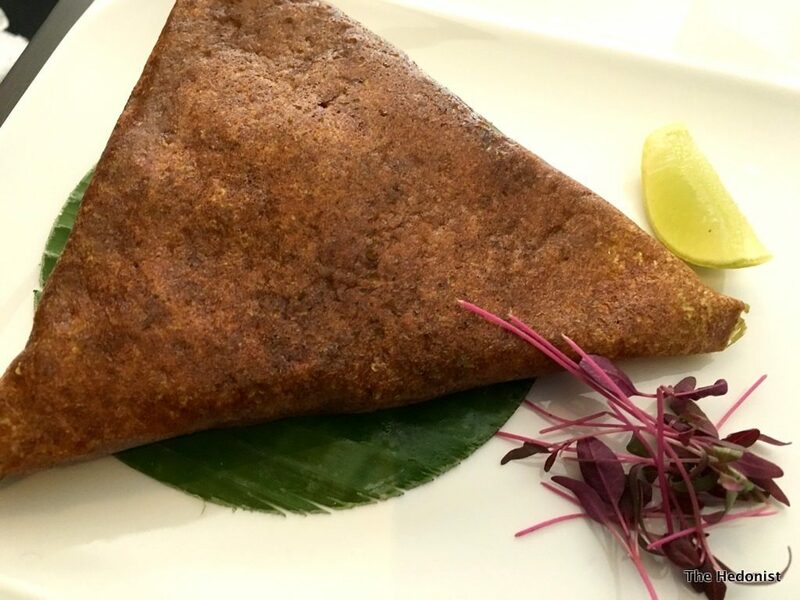 Dev Biswal is the chef/patron of two prize-winning Indian restaurants situated on either side of the East Sussex/Kent borders both rather handily called The Ambrette. The Margate version came first but on a rainy winter’s lunchtime we had been invited to the historic White Vine House in the main street in Rye to review the newest addition to the family. 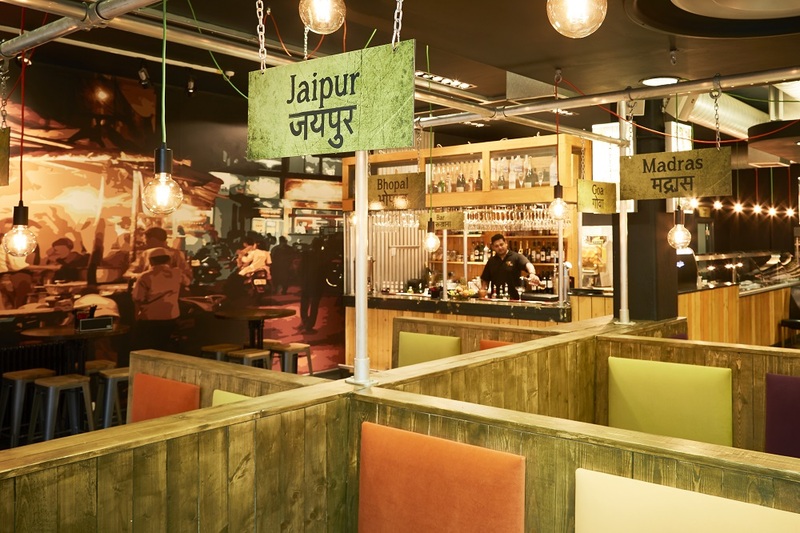 Dev’s mission is to combine the best of British ingredients with contemporary Indian food trends to create a new take on the Anglo-Indian food tradition. Rye is an extremely pretty little town with a history both literary, Henry James’ house and museum is here, and maritime, as member of the Cinque Ports federation. 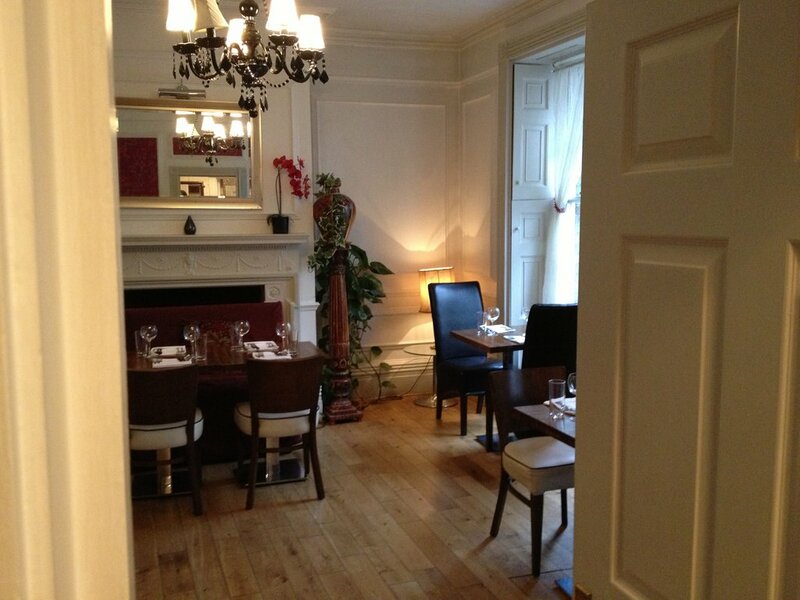 As for The Ambrette, it is located in a delightful building in the High Street. 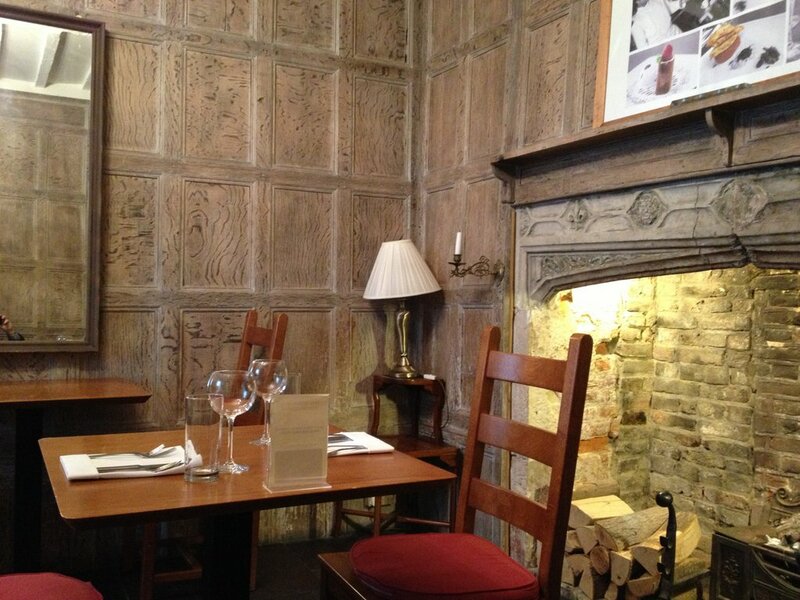 The interior is smart without being stuffy with Tudor panelling, log fires and a warm welcome from the staff. We start with a crisp and floral glass each of Di Maria Prosecco (200ml £10.99) whilst we investigate the Lunch menu (1 course £8.99, 2 courses £14.95, 3 courses £19.95).The kitchen sent us out a couple of pre-starters. 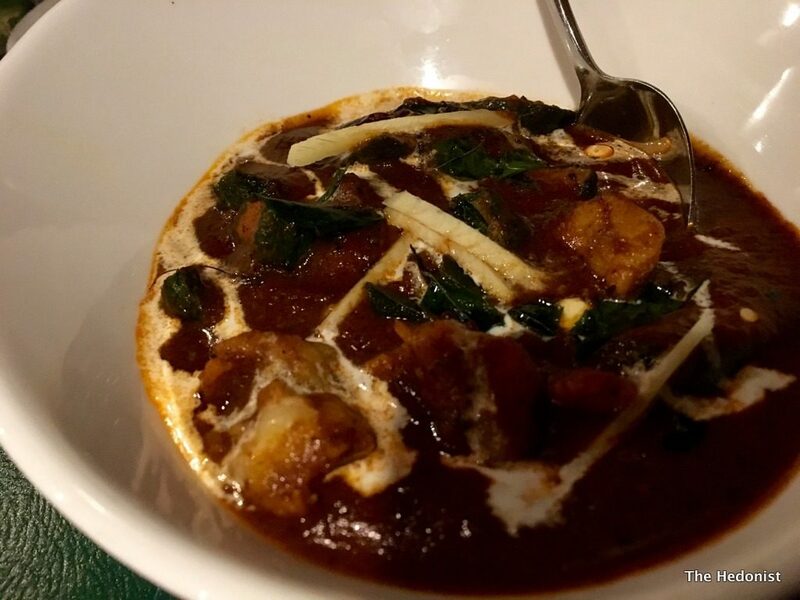 Prettily served spiced paneer dumplings came encased in a delicate batter with the paneer soaking up the sweet-sour flavour of the tamarind chutney, whilst Spinach ginger and garlic soup was earthy, warming and perfect for the weather. We moved on to the citrus and spice flavours of a Cape 312 Chenin Blanc (£6.95 a glass) which was robust enough to stand up to the gentle spicing of the food. Chargrilled Artichoke Hearts were delicate and full of flavour, served with sweetened yoghourt and a selection of chutneys. Crab and beetroot cake came with the highly on trend locally grown sea purslane and a crab raita-a great expression of Dev’s approach. Pan fried claresse is a European freshwater fish from the catfish family. Paired with locally grown sea beet served with kedgeree, coconut sauce, ginger and mustard it was bursting with flavour. Fresh aubergine was filled with Kentish goats cheese, mushrooms and cumin spiced marrow, fennel potatoes and a sauce of cashew nut and mint. 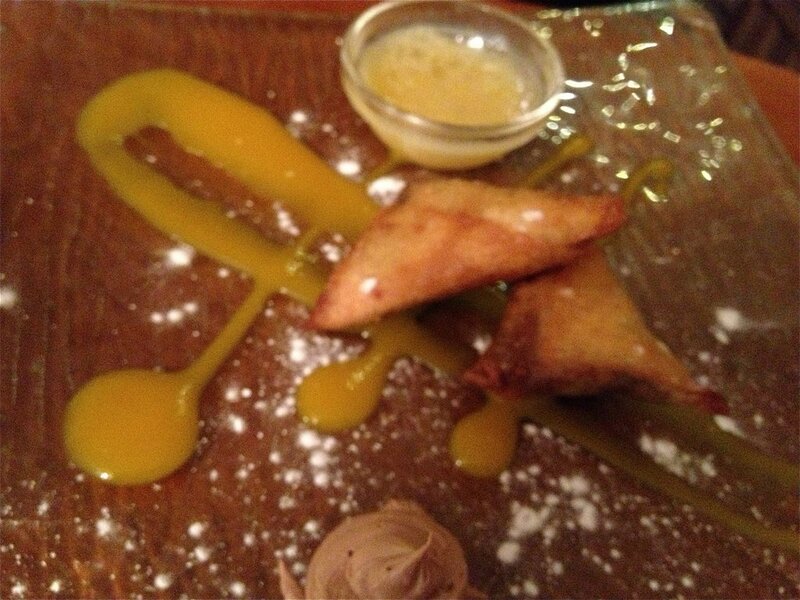 I couldn’t resist the chocolate samosas paired with Darjeeling chai jelly. 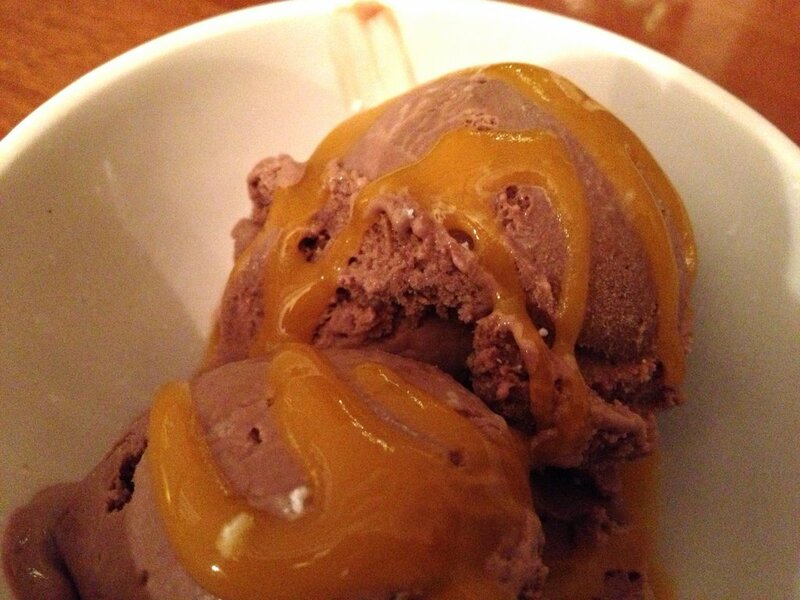 And the nectarine and dark chocolate ice-cream was a great combo. 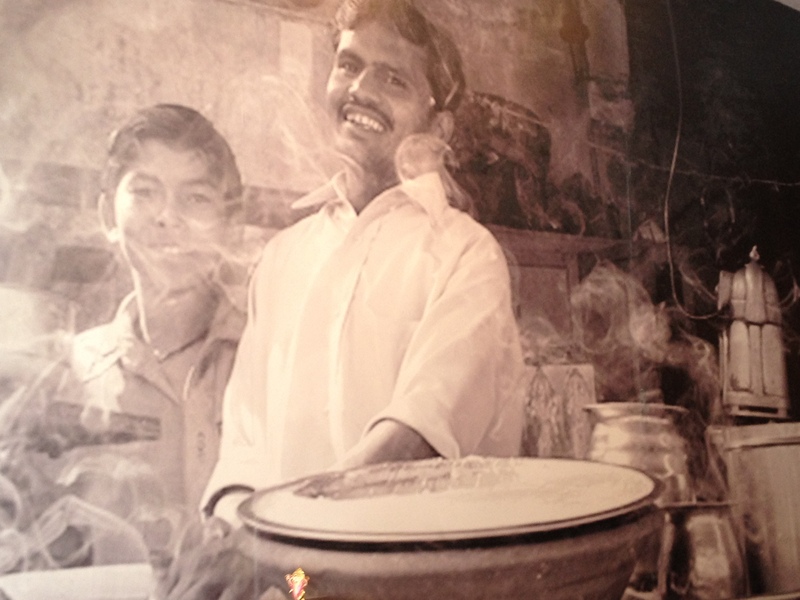 Dev Biswal is a chef with ambition and a strong sense of direction. Rye is wonderful destination and The Ambrette is well worth a visit if you are in the area. Since we extended the range of The Hedonist to cover the south of the UK as well as London, it has been a great opportunity to revisit old haunts as well as pastures new. 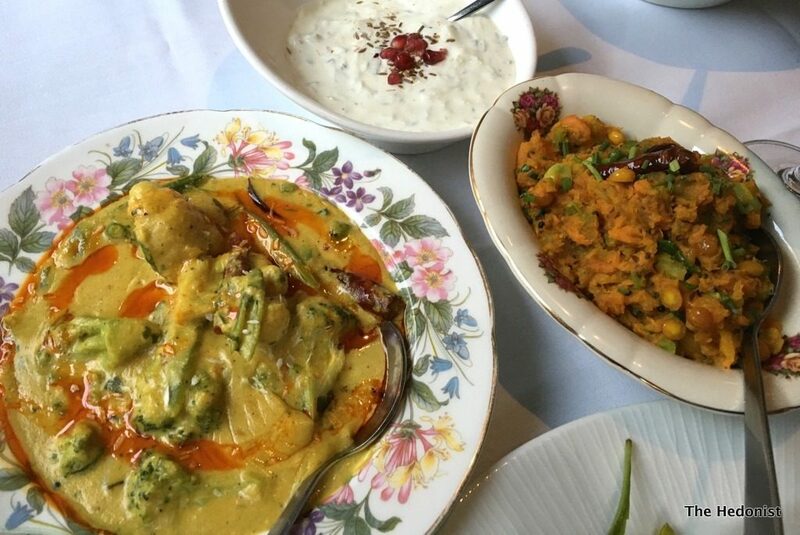 Brighton is a city I have both lived and worked in and so know it well, but Indian Summer is somewhere that hasn’t been on my radar before, so it was great to be invited to review it. 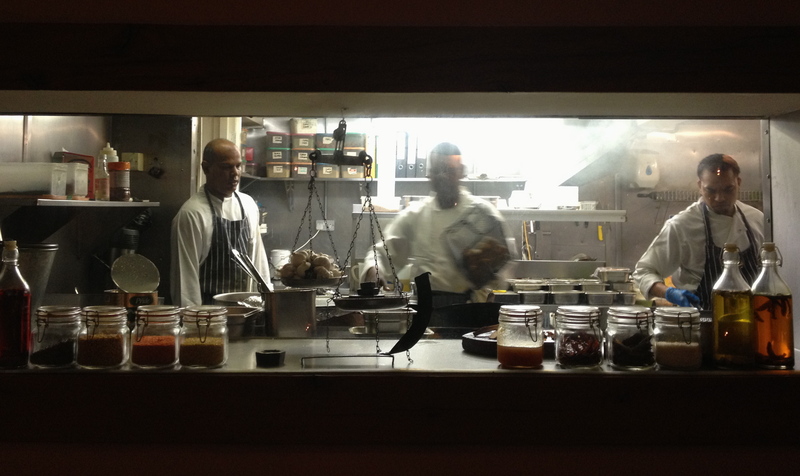 The restaurant has been a mainstay of the Brighton dining scene for 12 years now. Situated in East St, a favourite location for shopping and dining, that borders the Lanes and snakes down to the sea, the interior is an attractive blend of wood, dark browns, chandeliers and evocative huge black and white photographic portraits. As we checked out the menu La Hedonista was drinking a Kingfisher Beer but I threw caution to the wind and opted for a glass of Sula Indian wine (£5.95 for 250 ml). It was a pretty fierce Sauvignon that did at least stand up to the spice flavours that were to come. As a pre-starter snack we opted for the Bhel Puri (£4.95). 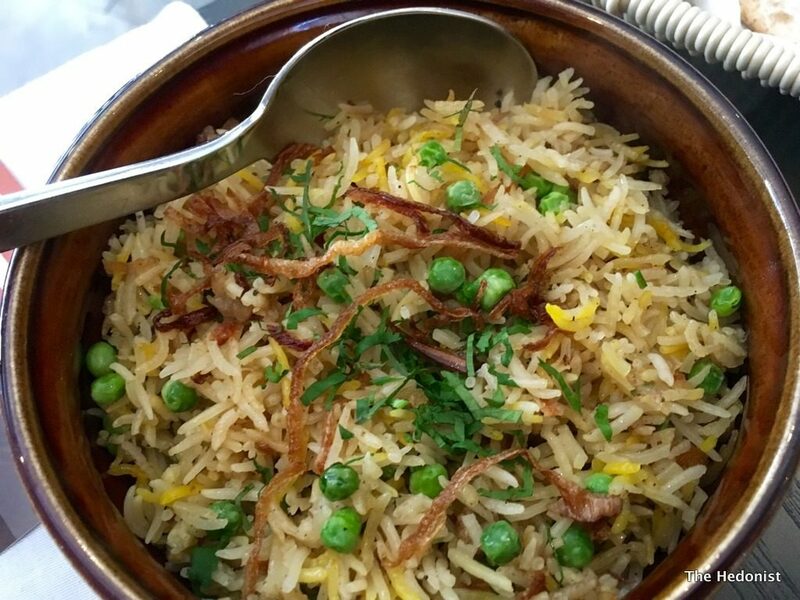 It is a classic mix of puffed rice, gram flour sticks, potatoes, onions, chickpeas and tomatoes, served with an overlaying of coriander and chilli, date and tamarind chutney and yoghurt. Combined together it’s a refreshing blend of crunch and sweetness, sourness and spice. 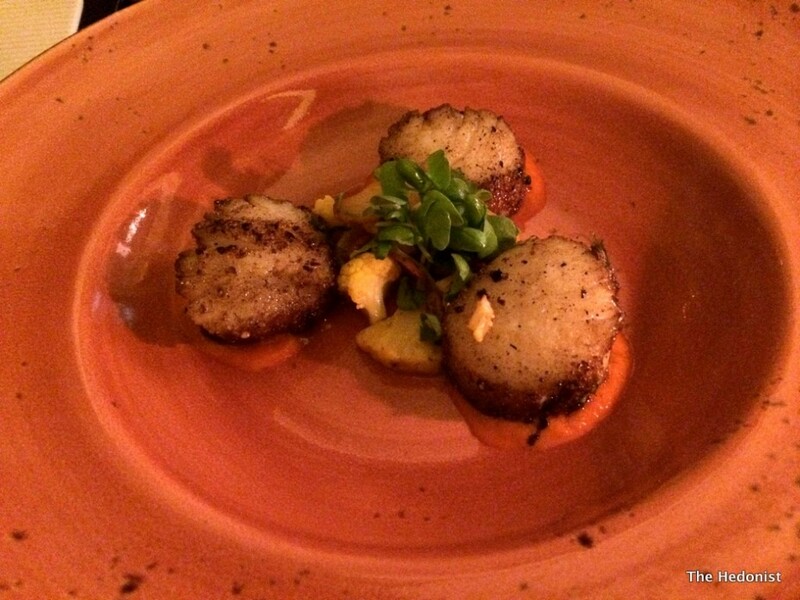 It has a terrific mouth feel and is a deservedly popular dish. 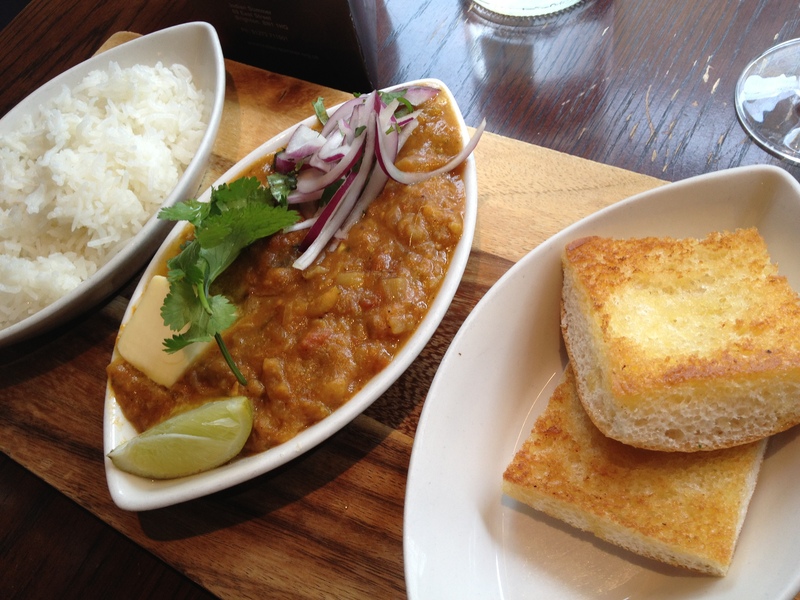 Indian Summer offers a selection of lunchtime Thalis (£9.95-£12.95) but we opted for the 2 course lunchtime set menu (£14.95). 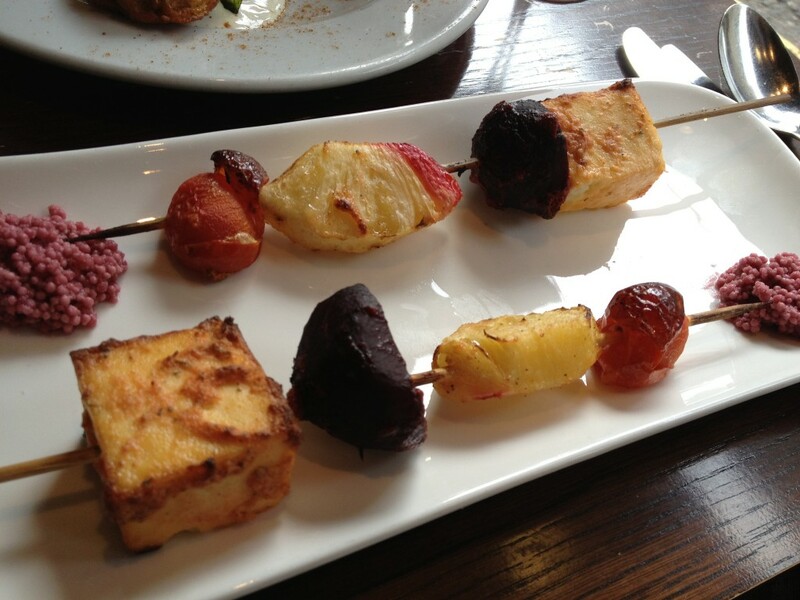 Our first starter was Paneer Shashlik which featured grilled cubes of paneer, pineapple and beetroot. 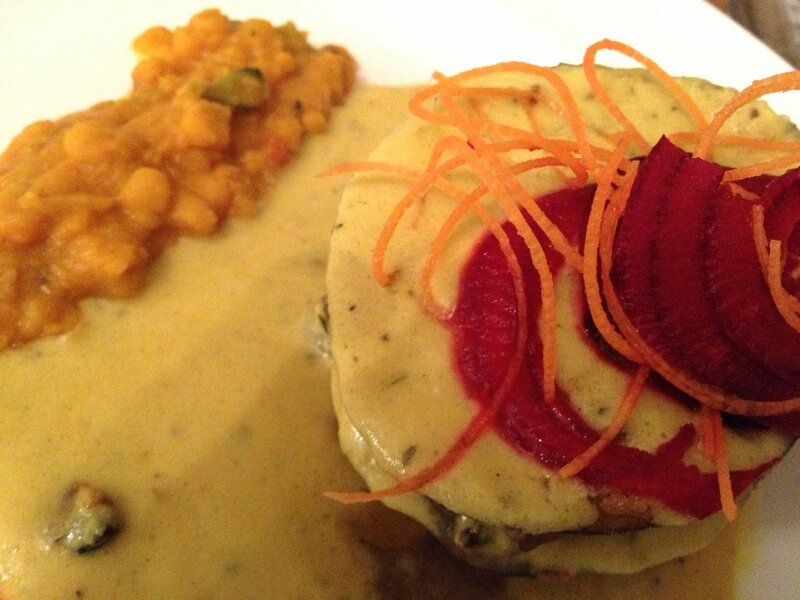 This was a simple but really effective dish-the beetroot was perfectly grilled and the paneer still moist. Onion Aubergine Pakoda was really like a bhaji. 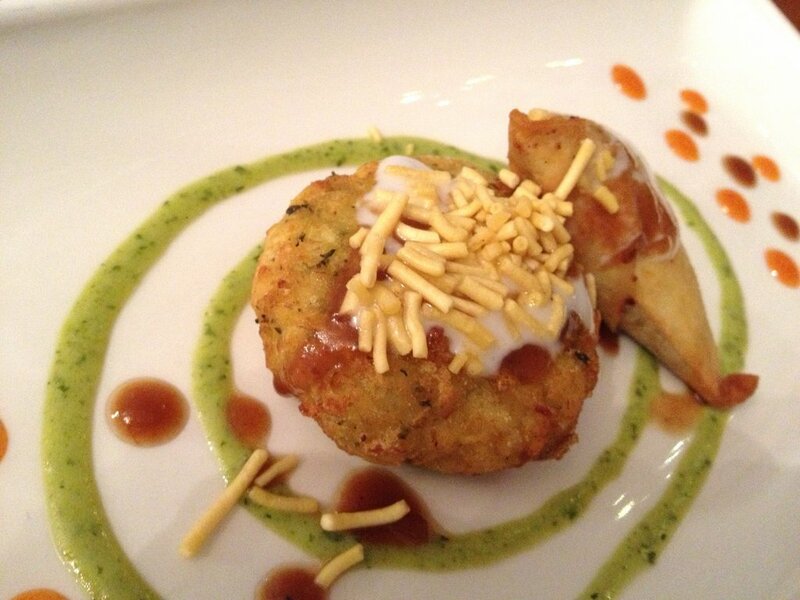 It had subtle cumin inflected spicing and came with a crisp batter and yoghourt dipping sauces. Alleppey Prawn Moilee, our first main dish, came with a good helping of juicy prawns in a mild-flavoured onion and coconut sauce. The additional beans, courgettes and broccoli were a bit overcooked for my taste but the basmati rice was perfect. The Pao-Bhaji vegetable subz was a rich, buttery and well-spiced vegetable curry topped with coriander and butter. 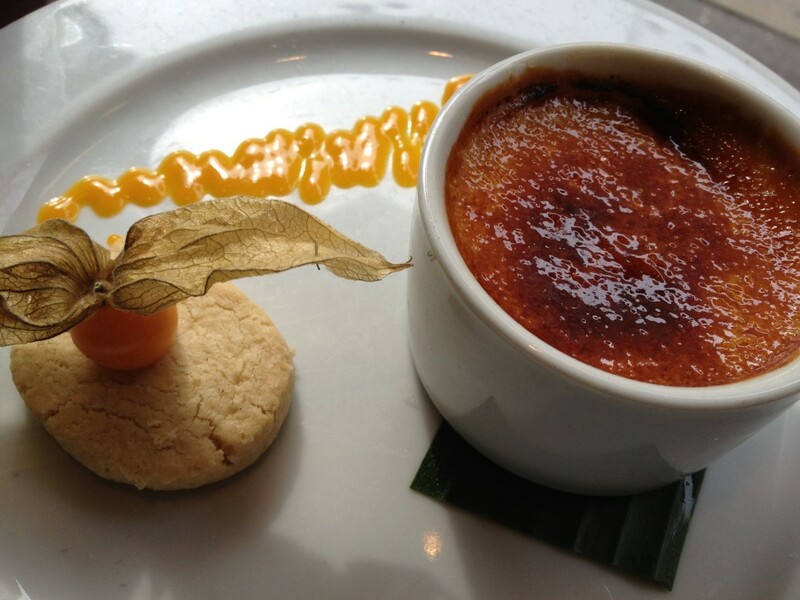 For dessert we shared a Mango brûlée with coconut shortbread. This was a really good creme brûlée with a crispy caramelised top and a ‘yolk’ of mango purée inside. 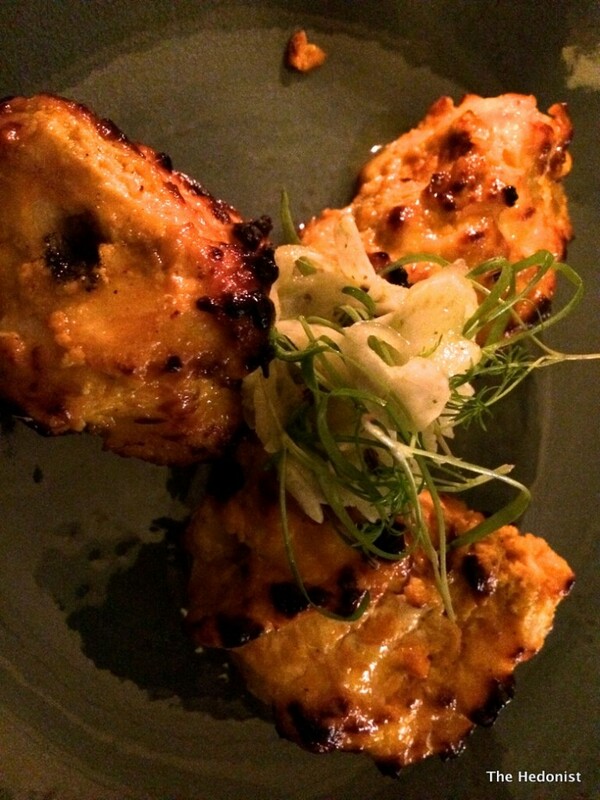 Dinner at Indian Summer is £22.95 for 2 courses and £27.95 for 3. 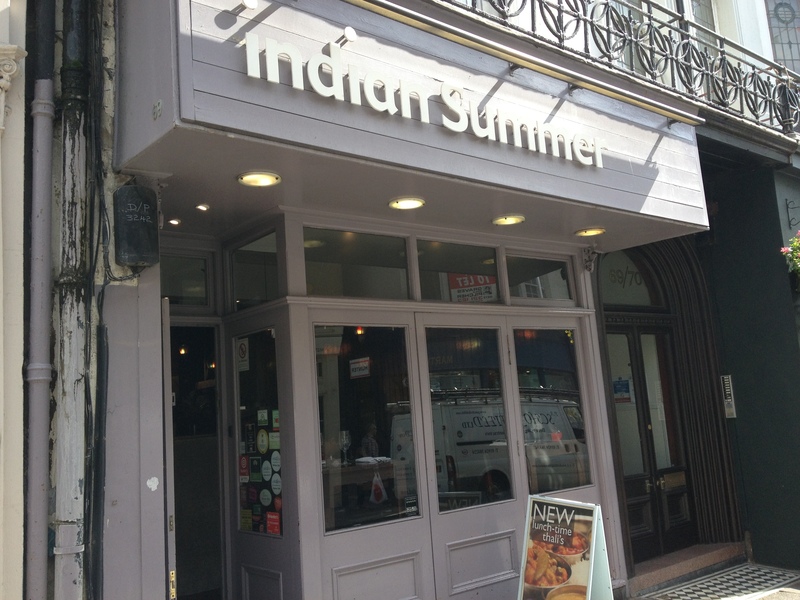 There is a wider choice of dishes than at lunchtime and on Sunday lunch they do a Tandoori roast; but whatever time of day you choose you are going to find some of the best Indian cooking in Brighton at Indian Summer. I spent my early childhood in the Hammersmith area so any trip back is particularly evocative for me. It was the 1960s and I remember going to the market with my tiny Greek grandmother. She had very firm ideas about which traders supplied the best produce and would act as if she was at a street market in Athens’ Plaka district, selecting her veg by hand in a way that was unheard of in those days in the UK. 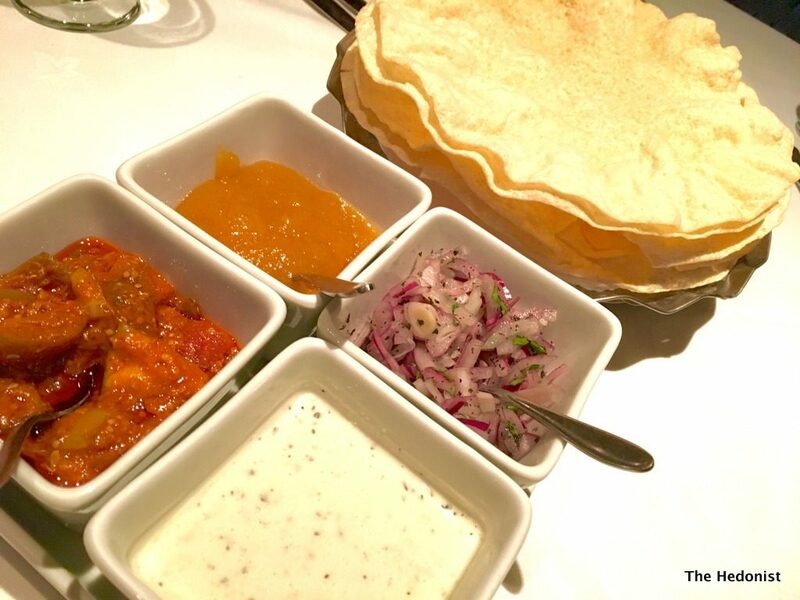 By the 1970s and slightly further down King St emerged Hammersmith’s famous Curry Lane. 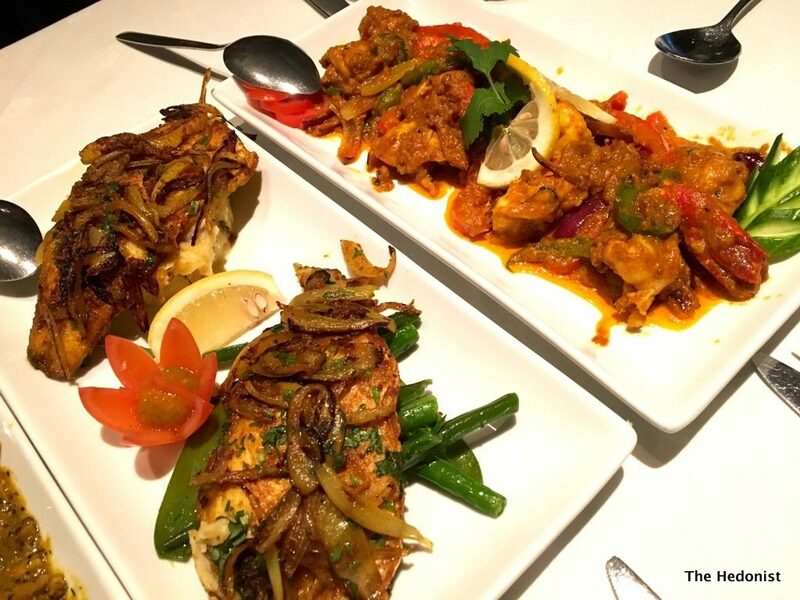 This destination stretch of restaurants gave well-heeled West Londoners the opportunity to indulge their need for culinary heat and spice without heading out to the rawer streets of Southall. 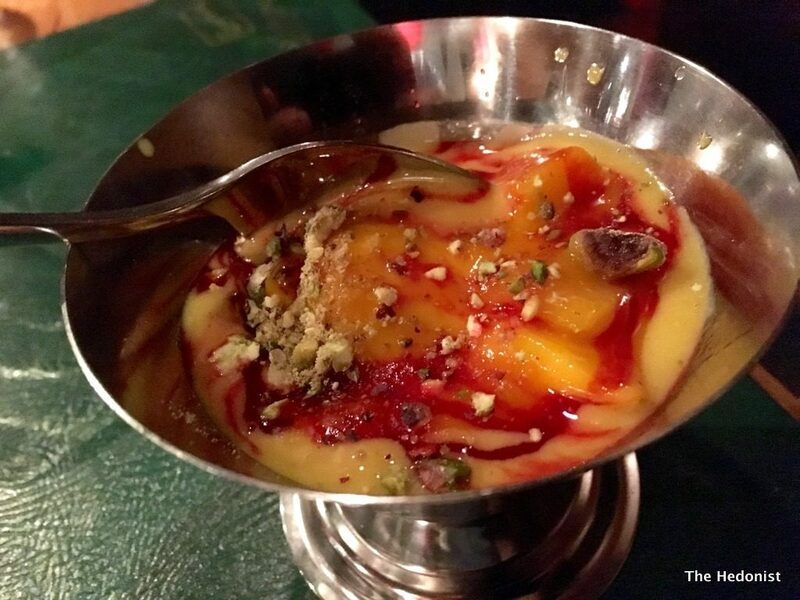 On the site that used to house Tandoori Nights, one of the most iconic of those early curry houses, sits Potli and I have been invited to a tasting of their new summer menu by Zoe Perrett, The Spice Scribe, one of the most informed, engaging and articulate advocates for Indian food in London. 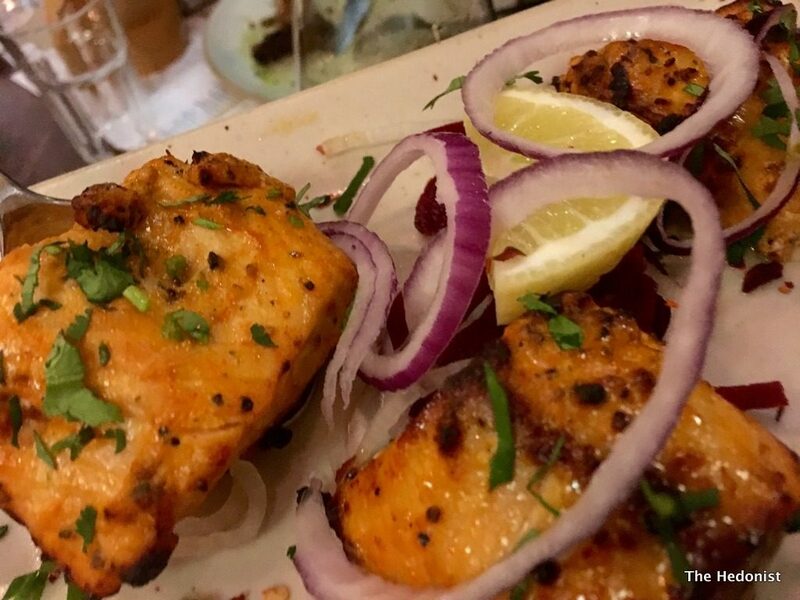 The food at Potli is inspired by some of India’s most famous street-food destinations, from Chandni Chowk in Delhi, the birth place of Chicken Tikka Masala, to Mumbai’s Chowpatty Beach and Chowrenghee Lane. But sadly we aren’t standing in the bustle of an Indian marketplace but are instead in W6 on a beautiful summer’s evening consoling ourselves by sipping Tamarind & Basil Martinis (£7.50). 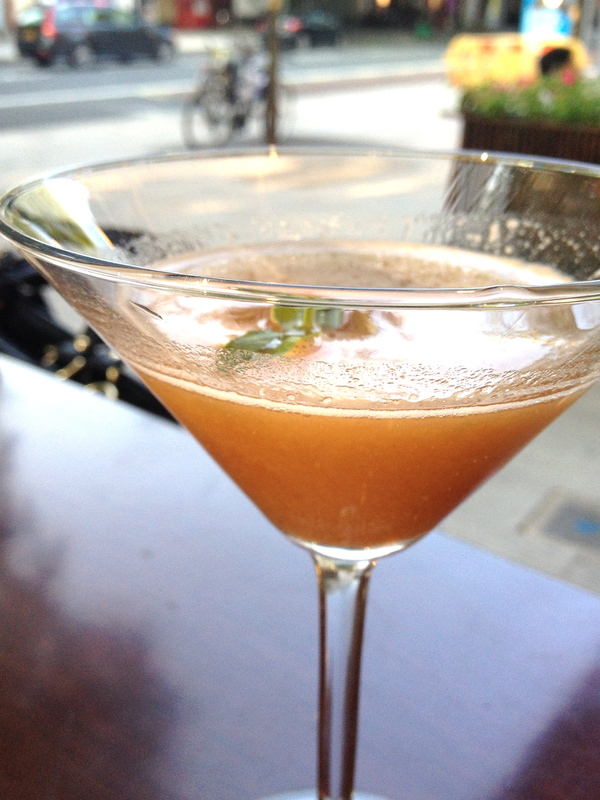 This was an elegant and well-balanced martini, the sour tang of the tamarind balanced by the vegetal sweetness of the basil and vermouth. 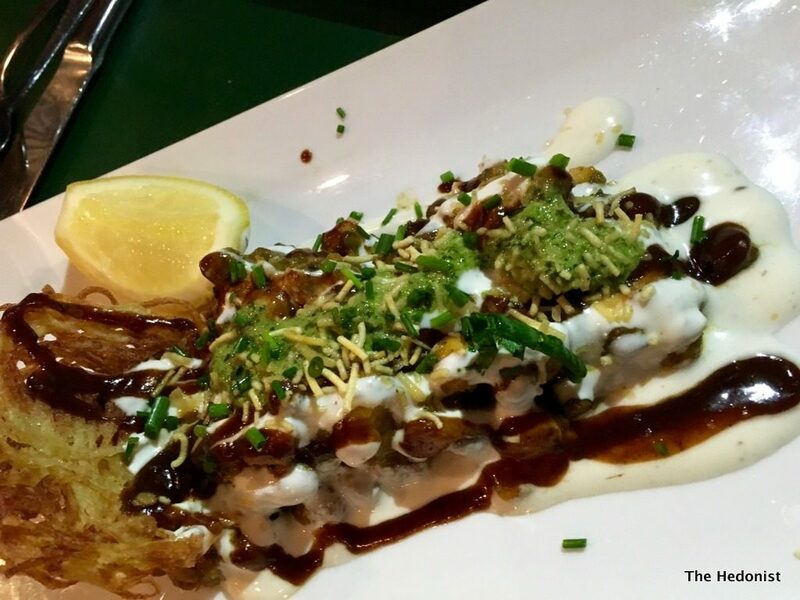 Aloo Papri Chaat are spiced potatoes and savoury fritters laced with date and tamarind relish, mint and coriander chutney, whipped yoghurt and topped with crispy vermicelli. . I adore them and these were crunchy and soft, sour and sweet, hot and cold all at the same time- a great mouth feel and taste. 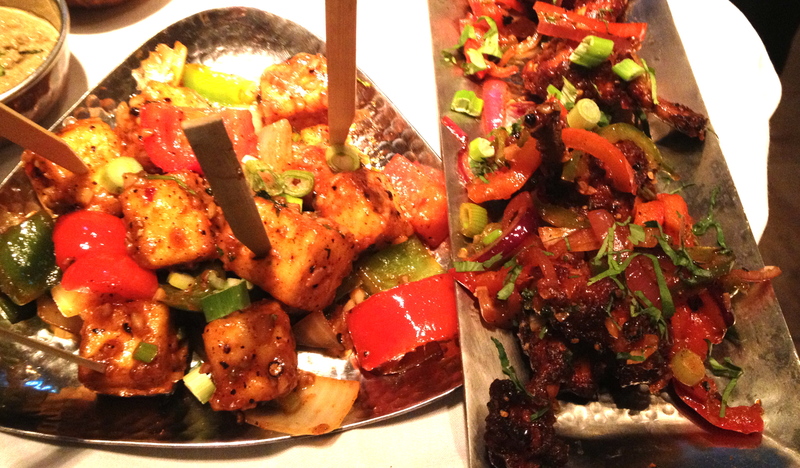 Drums of heaven were chicken wings, lollipop style, in an improvised Hakka style Indo – Chinese inspired dish. They had real depth of flavour. Shakarkhandi and Anar ke Chaat was a mix of sweet potato and fresh pomegranate in a tangy relish tossed with coconut flakes and chaat masala. Fresh pomegranate is turning up on so many menus now it is in danger of becoming a cliche, but I love its texture and acid sweetness against the enveloping warmth of the sweet potato. 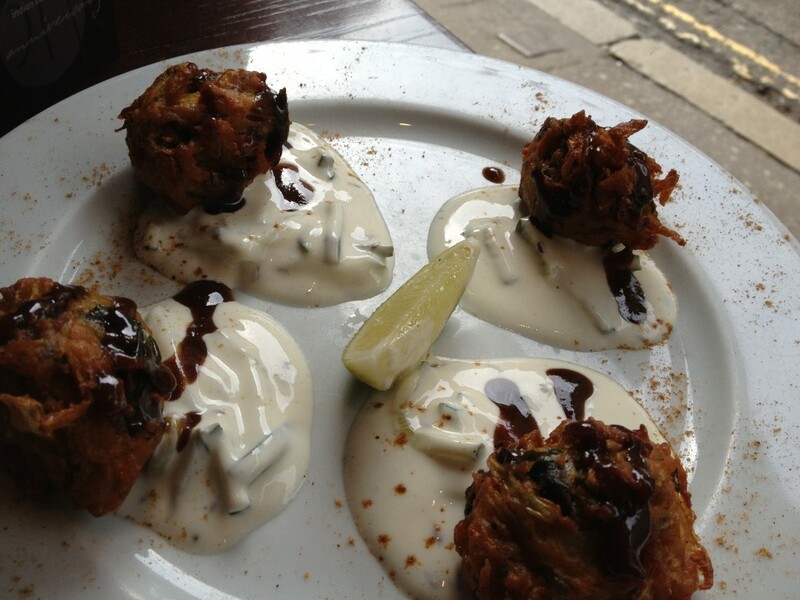 Onion bhajee were fresh and crisp, served with coriander. Sadly I had to leave the Indian Summer event at Potli before the mains appeared as even The Hedonist has to work sometimes. I will definitely go back. There is a real commitment to authenticity and quality and I want to see if that is articulated through the rest of the menu. 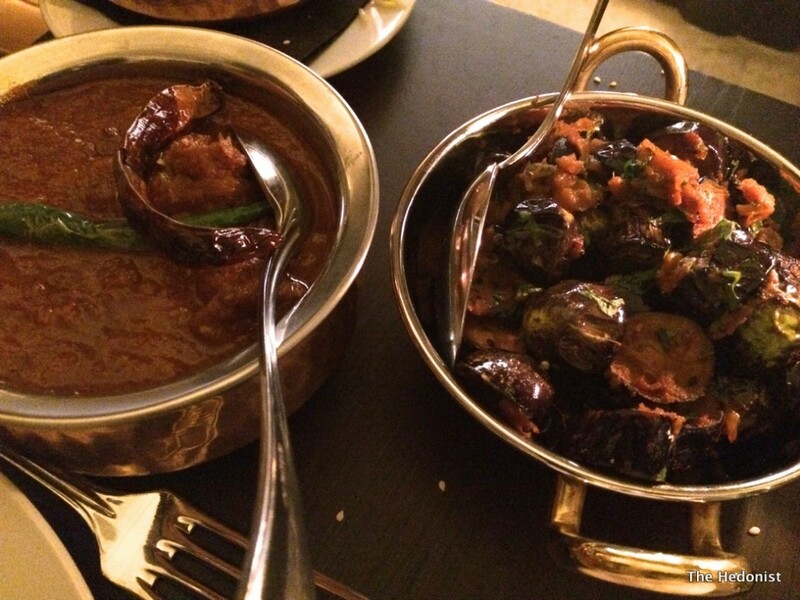 But if you are looking for some authentic Indian street tastes in Hammersmith you should give Potli a spin.